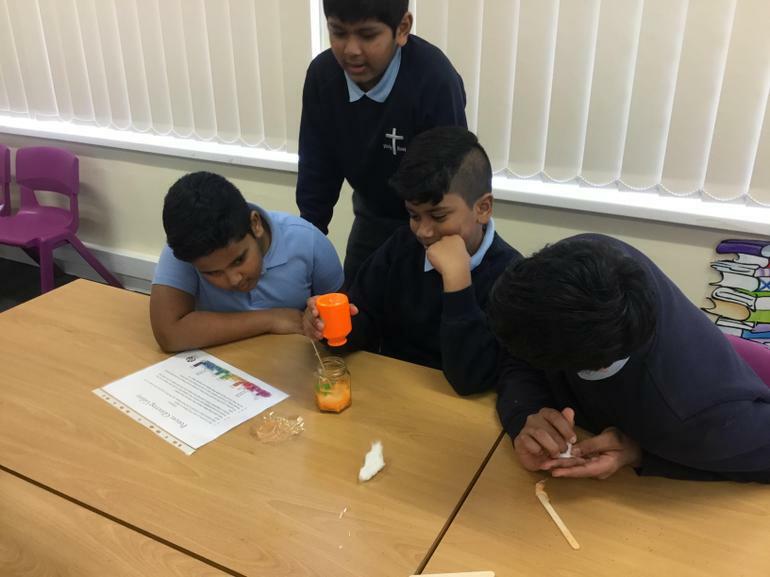 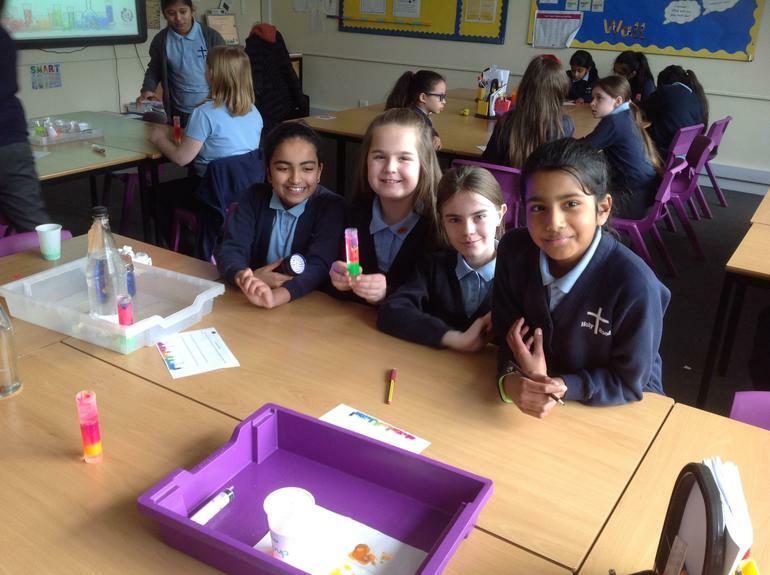 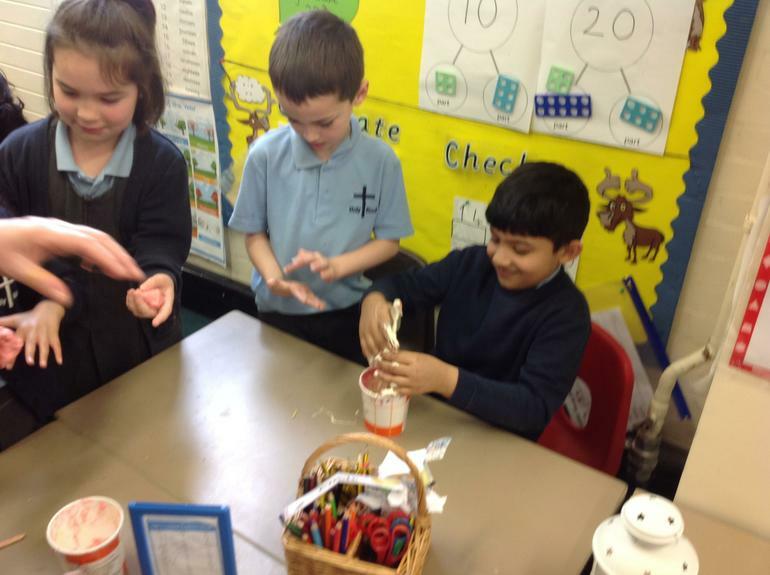 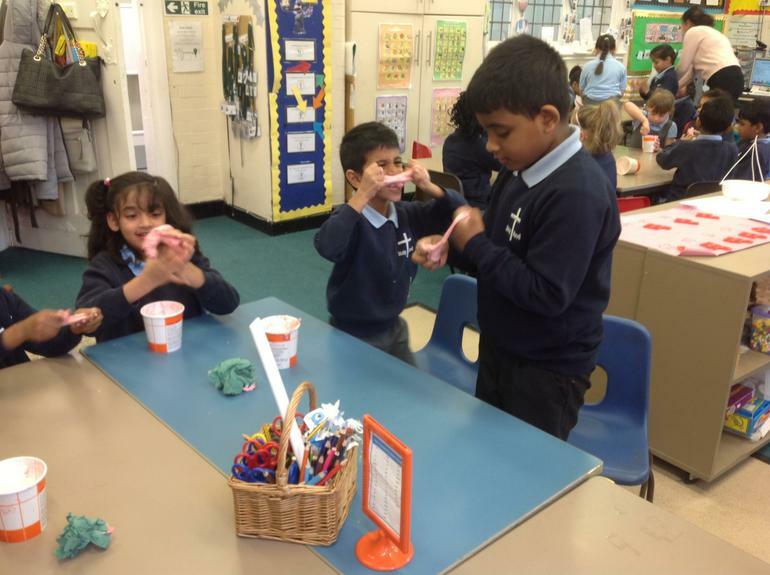 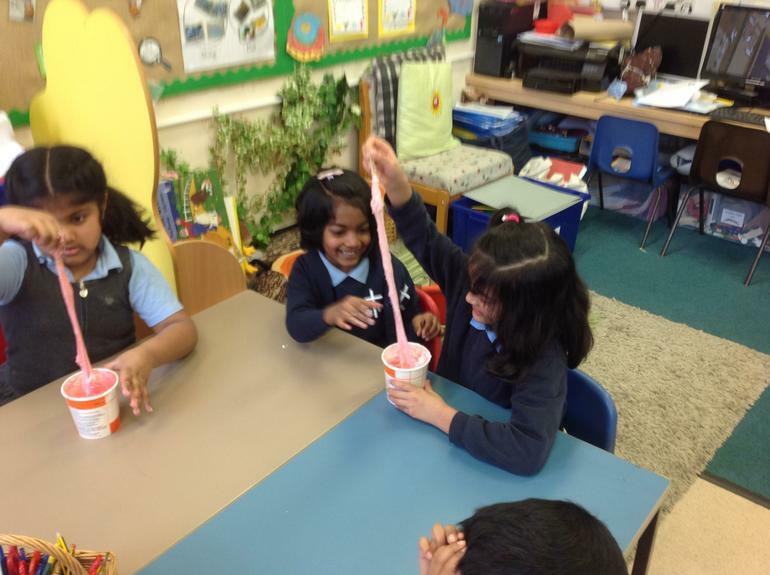 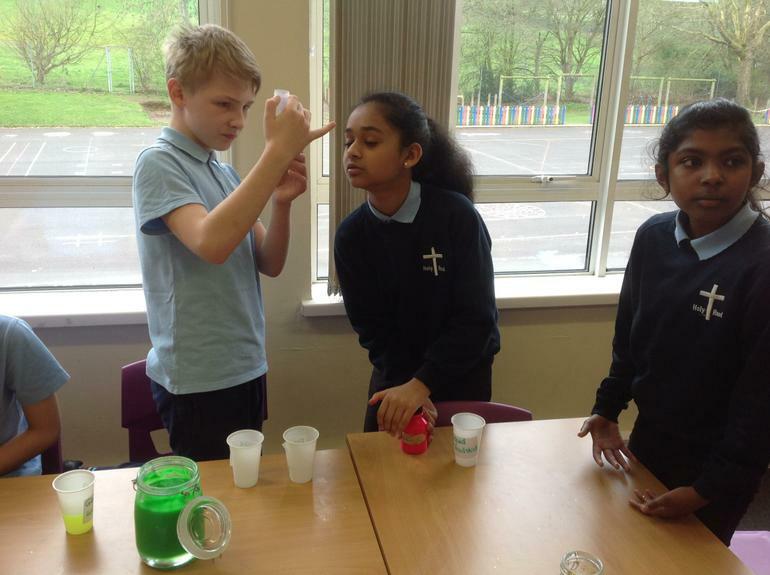 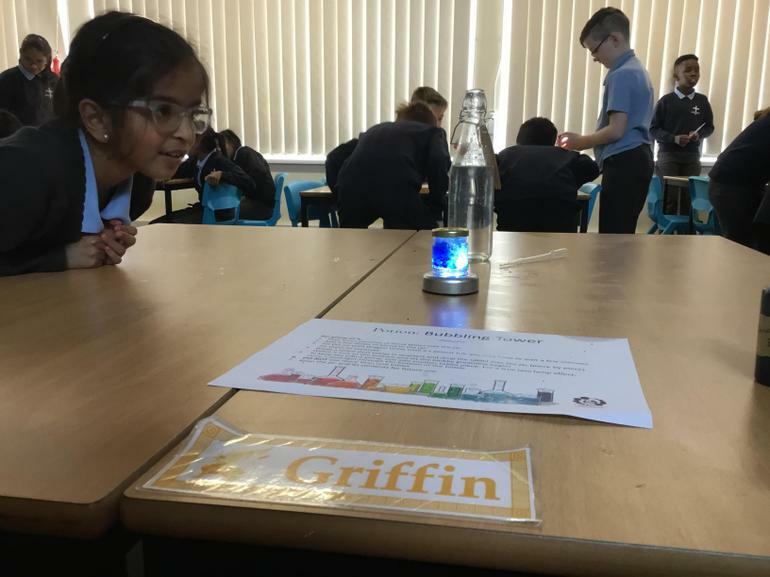 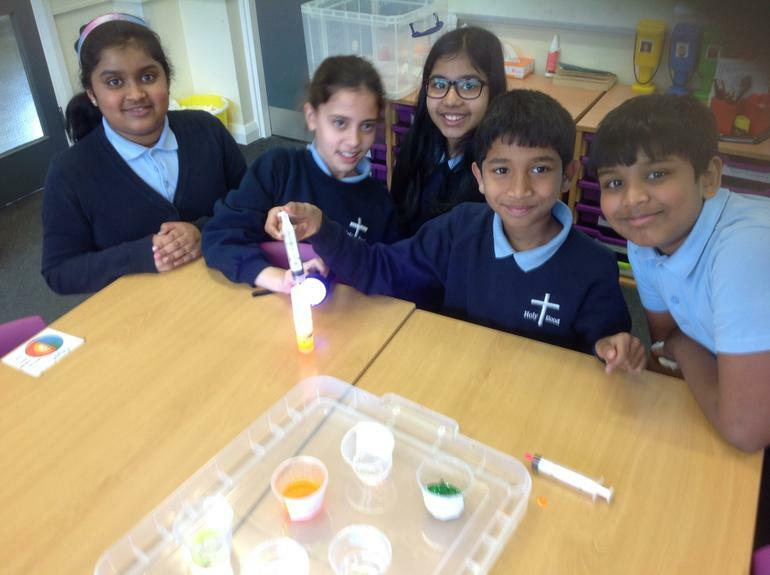 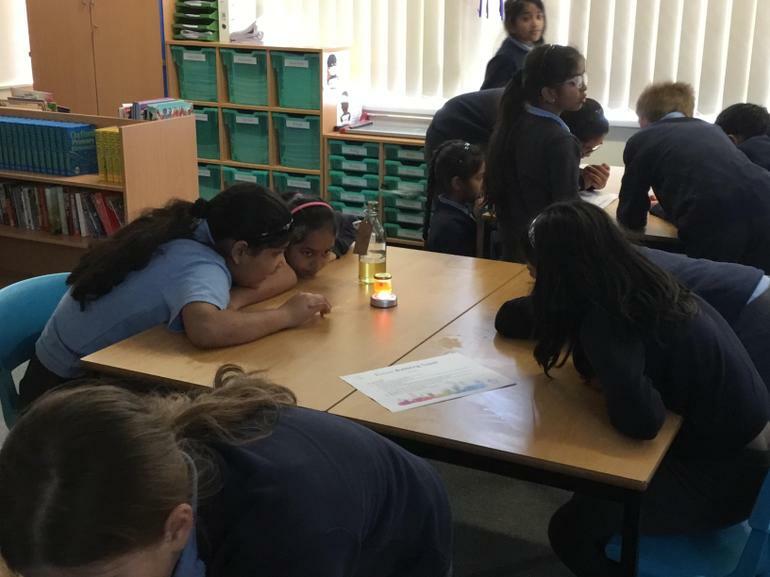 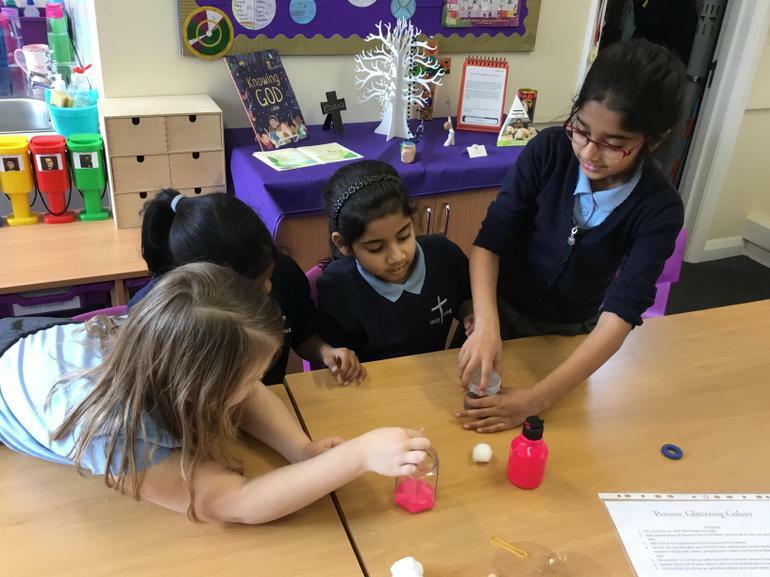 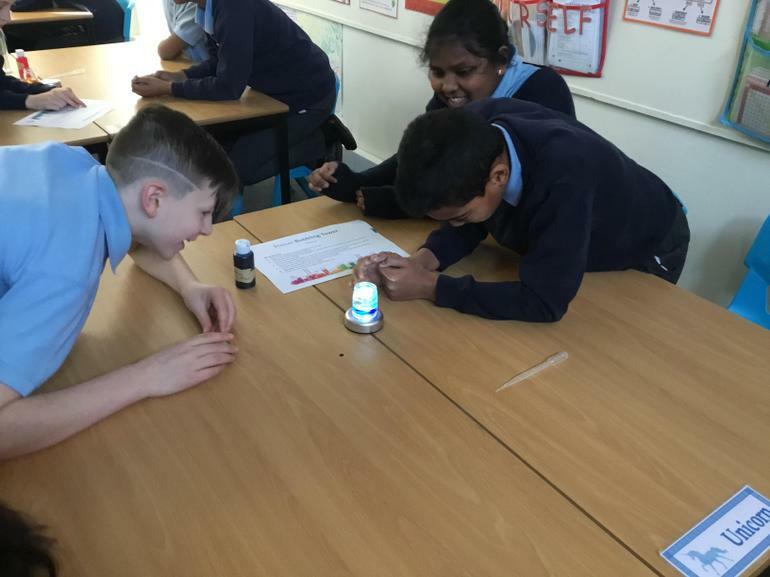 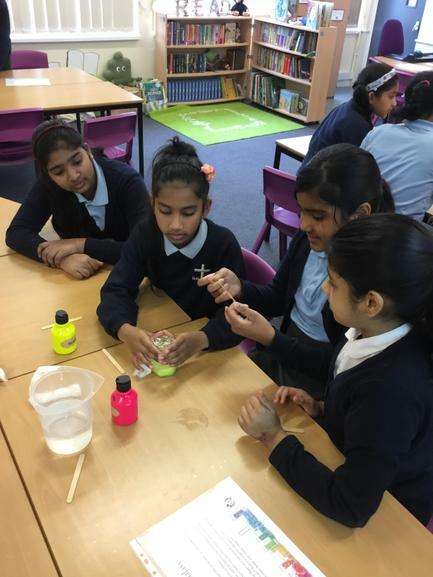 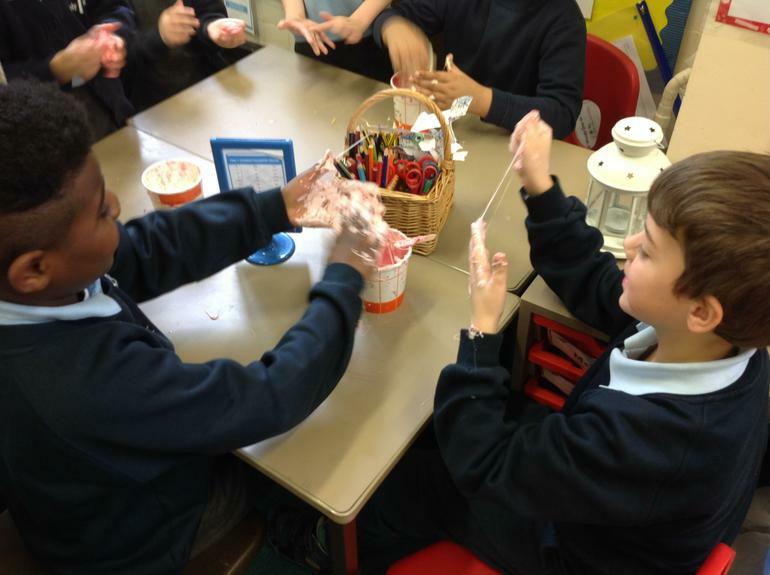 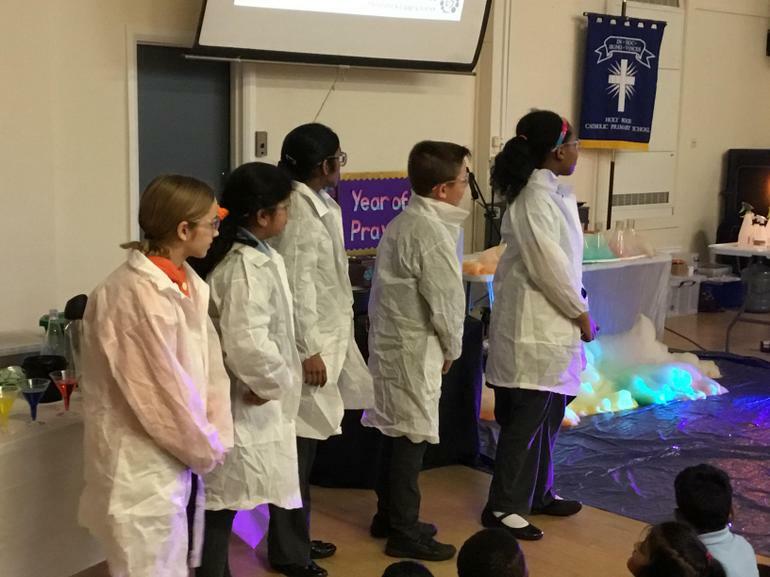 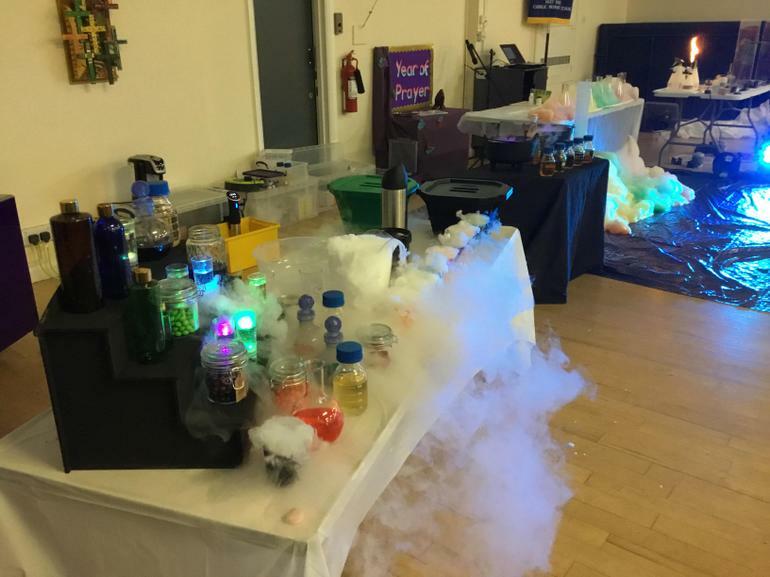 Science Day - We celebrated British Science Week this week with a whole school science day. 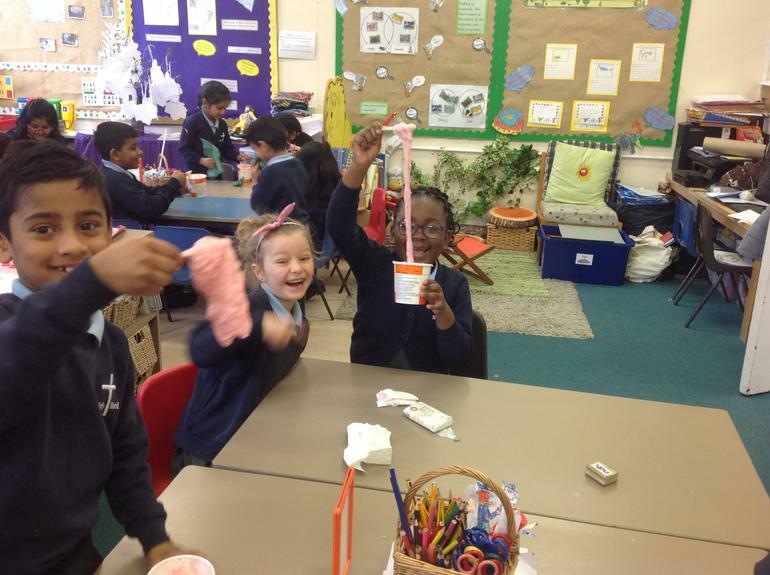 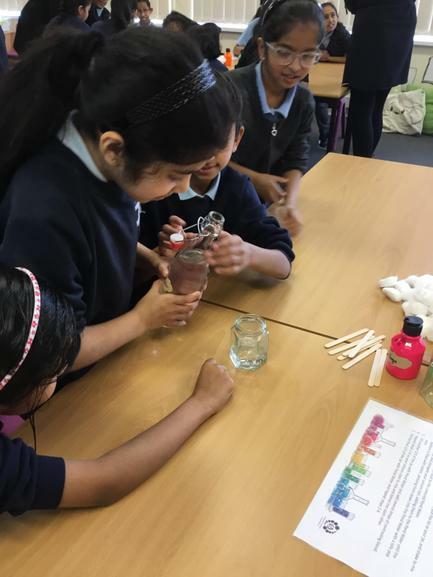 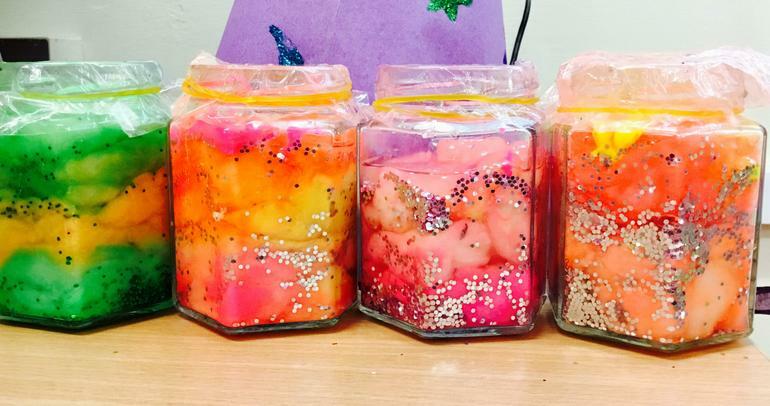 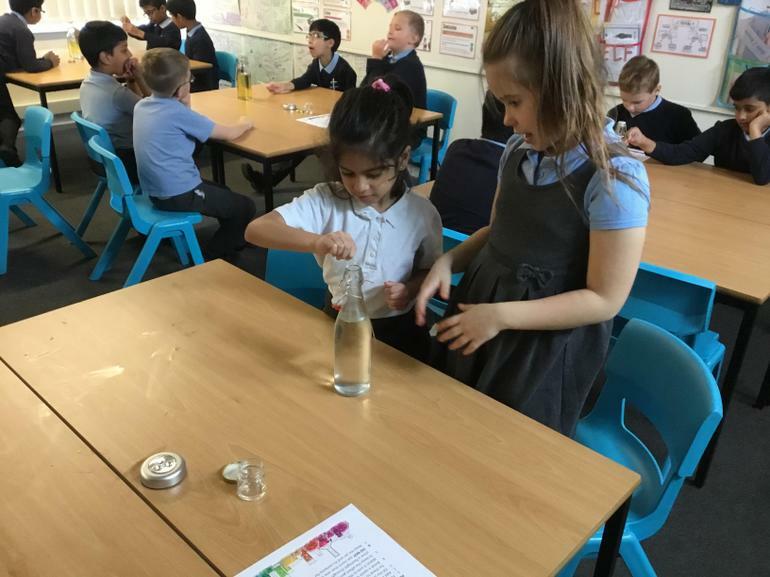 Unfortunately, Miss Fry and Miss Thomas had caught a mystery illness over the weekend so we had to work hard making all sorts of potions to try to make them feel better. 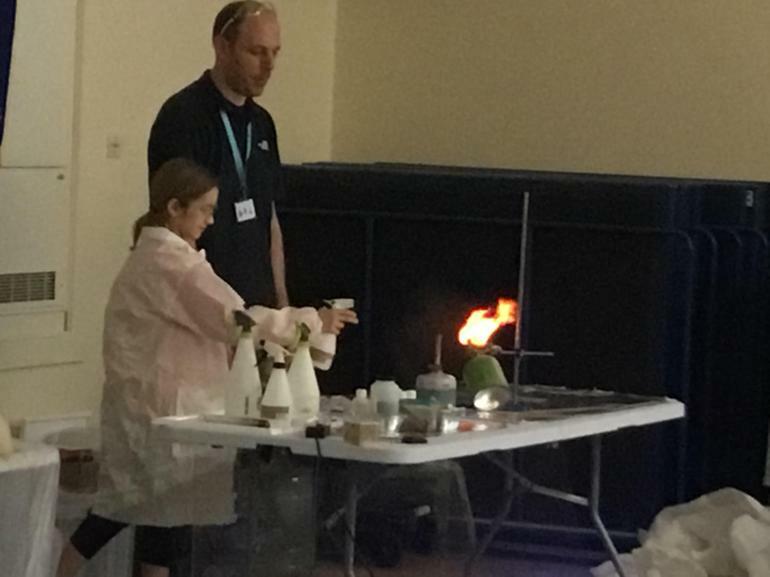 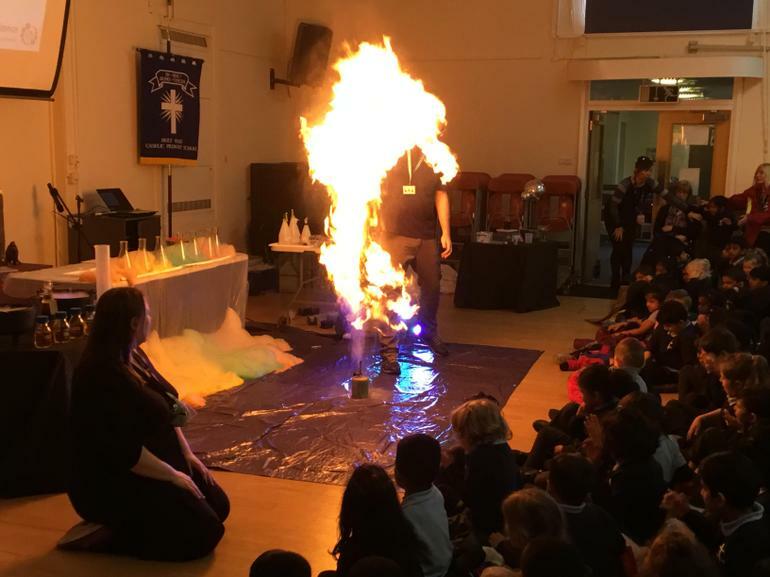 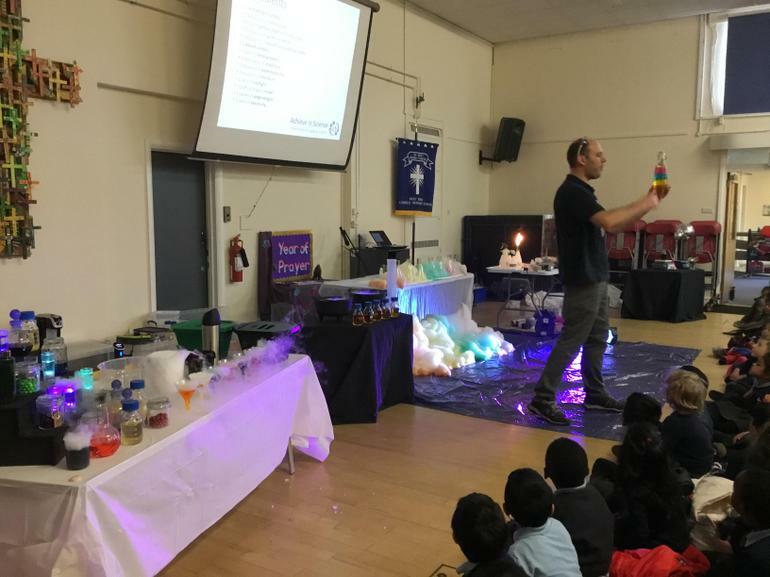 In the afternoon, we were lucky enough to be able to watch a fantastic assembly full of exciting explosions and experiments which was led by Mr Scutt. 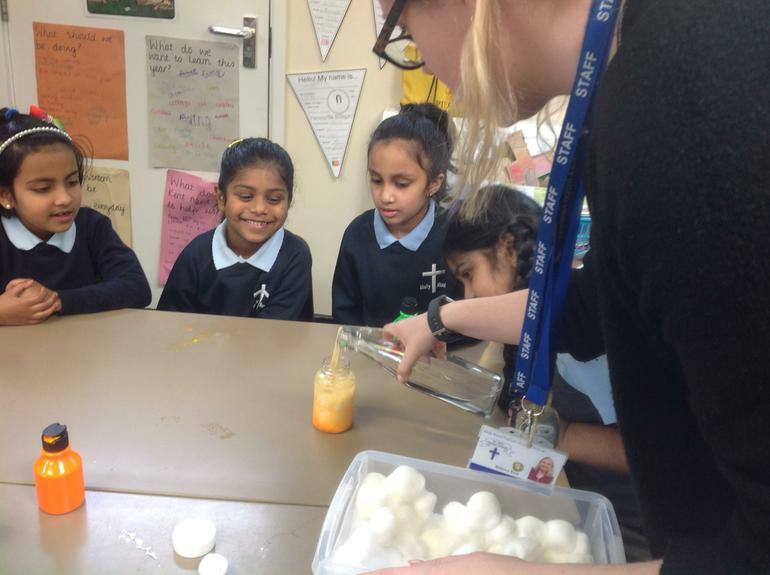 We are very grateful that, once again, Mr Scutt lent us all the equipment to be able to do the different experiments in our classrooms. 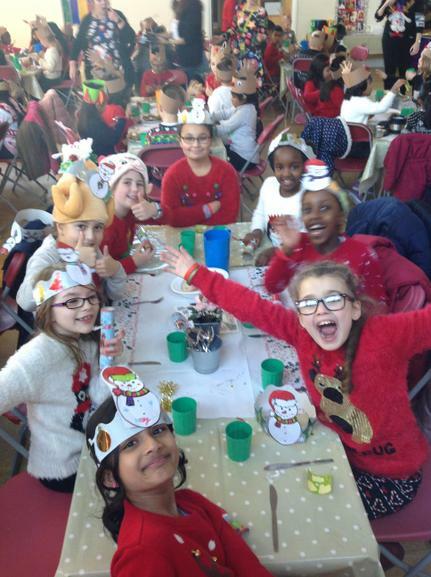 As you can see from the photos, we had a fantastic day. 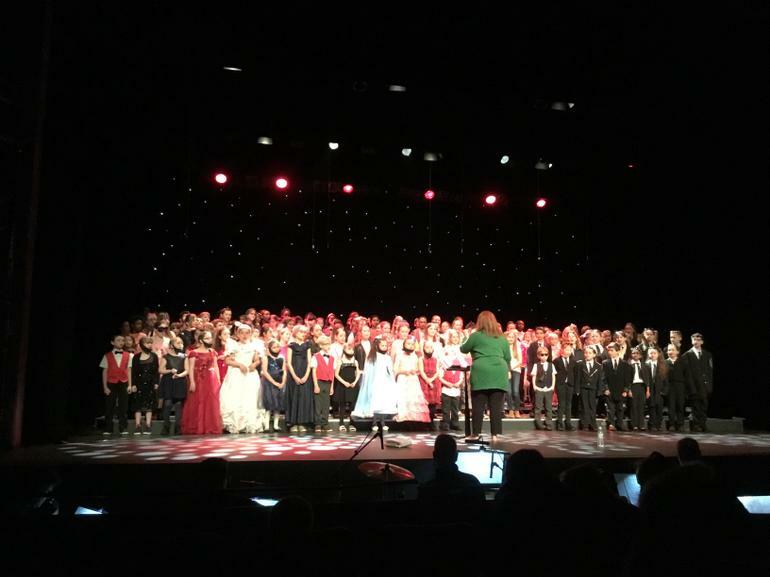 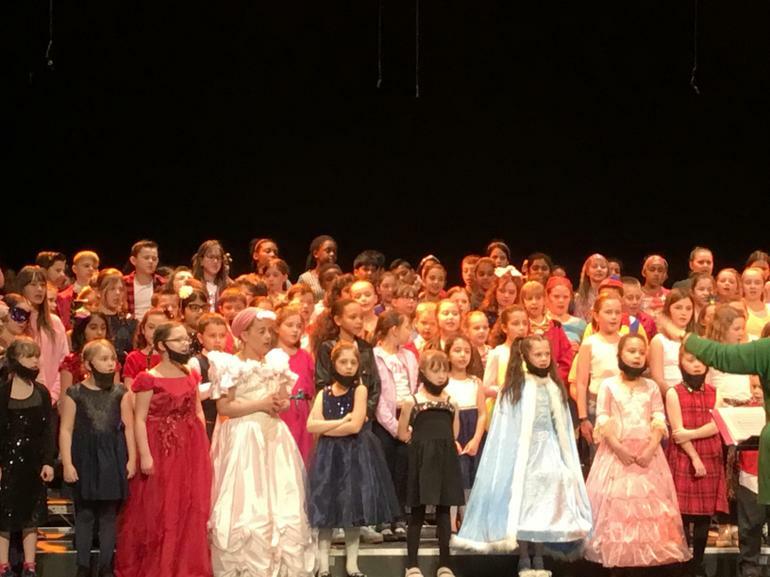 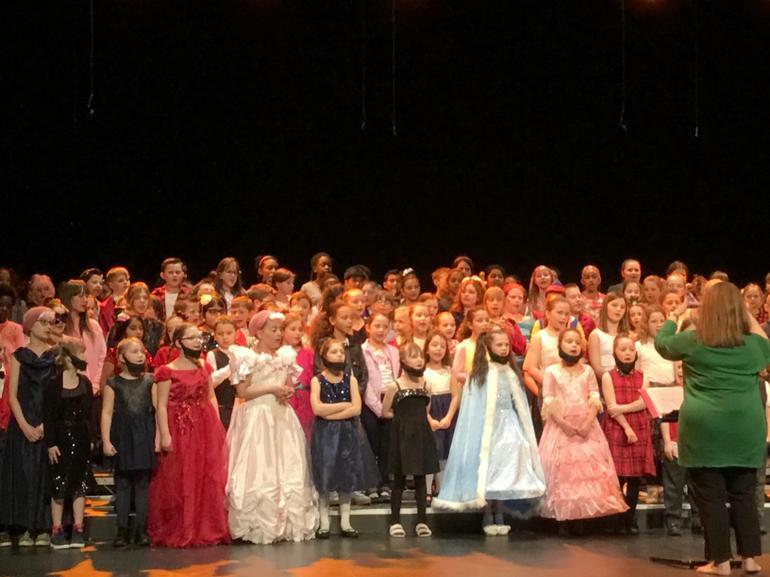 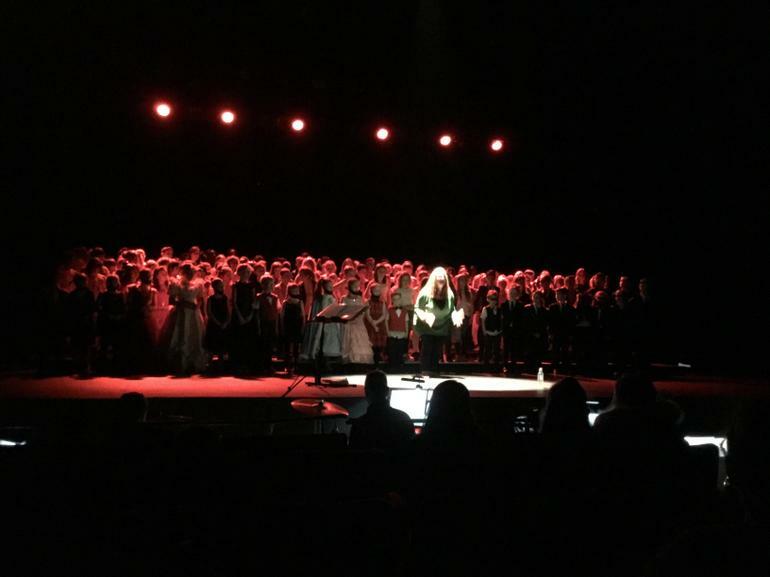 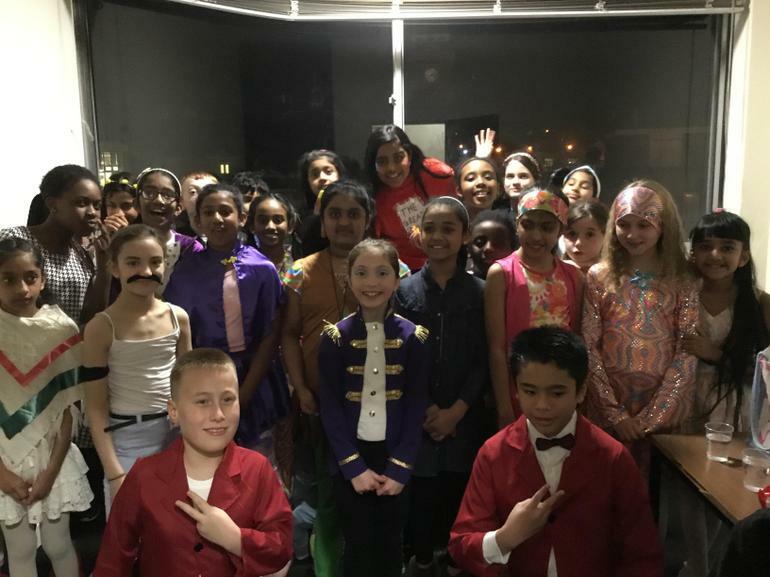 Junior Music Festival 2019 - The KS2 choir had an amazing time performing on the Wyvern theatre stage at the Junior Music Festival! 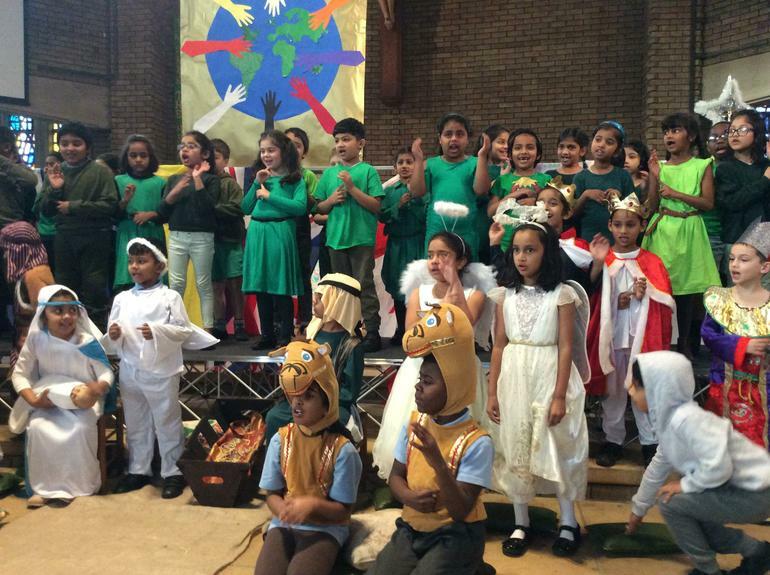 They worked hard to learn a range of songs from various shows and performed them brilliantly - well done! 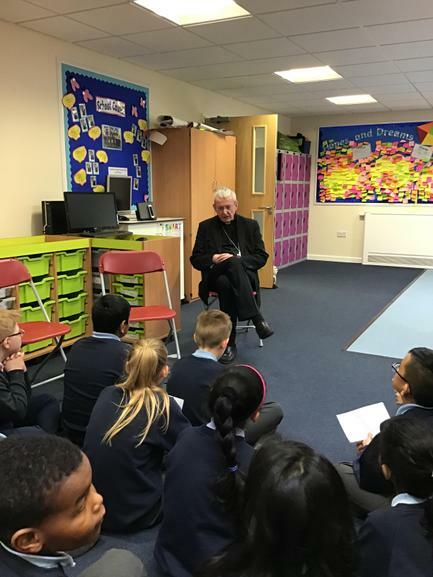 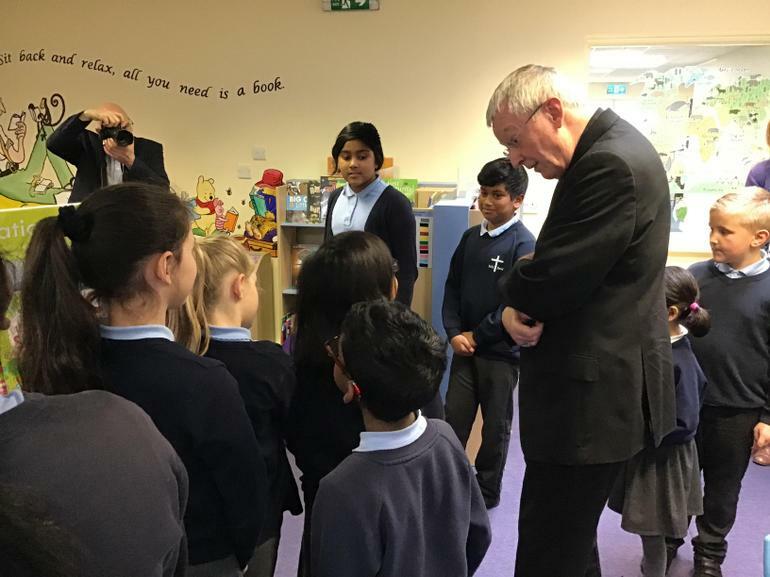 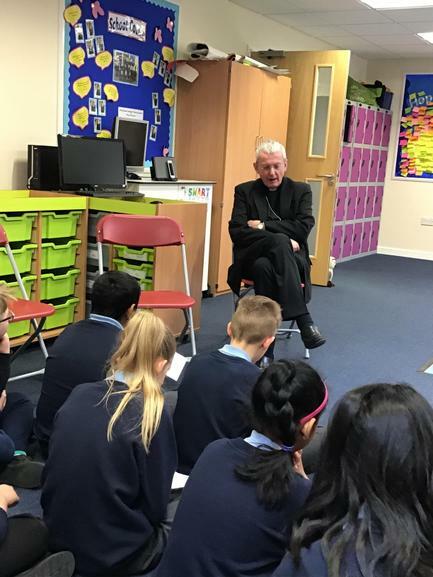 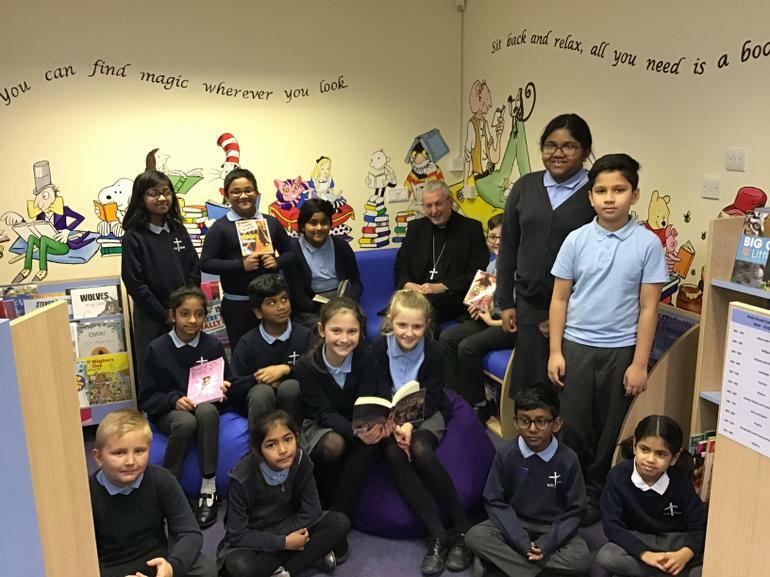 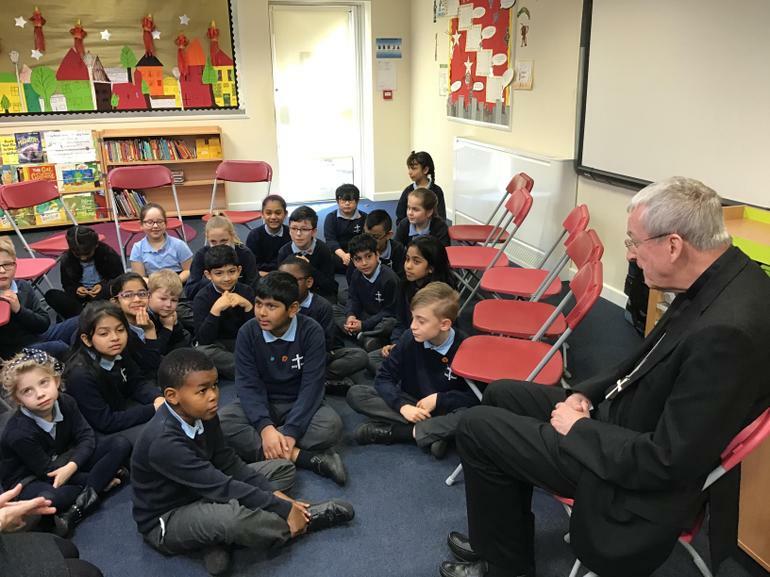 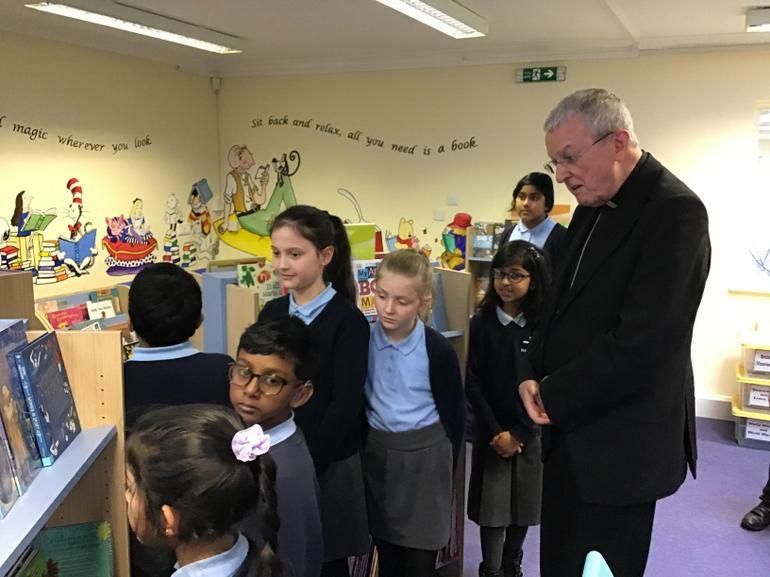 We were honoured with a visit from Bishop Declan on Tuesday 5th March 2019. 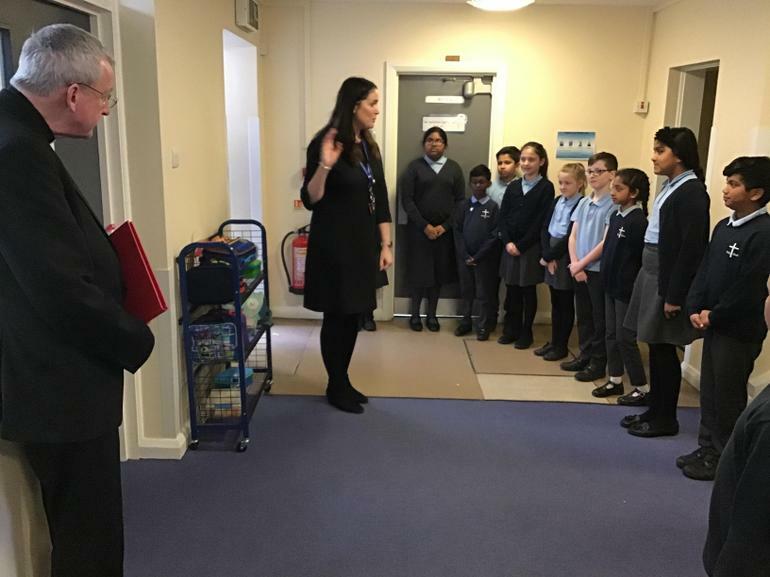 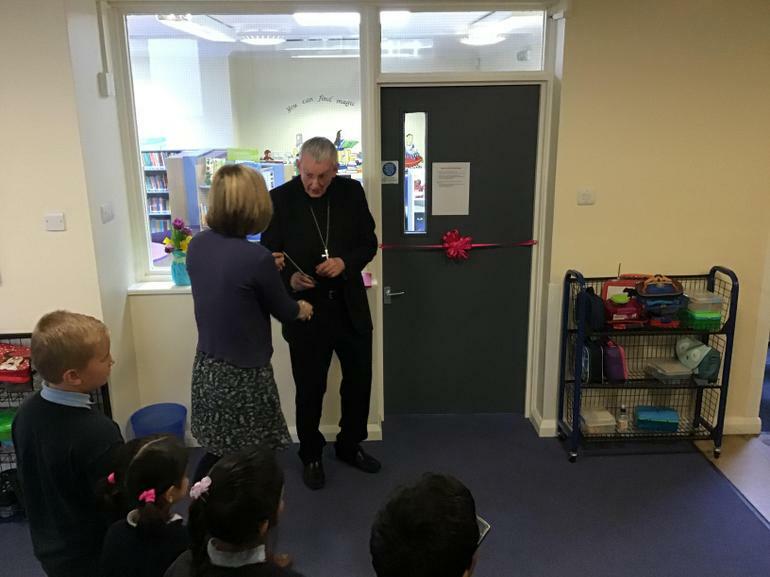 He took the morning KS2 Assembly, blessing the new Primary School. 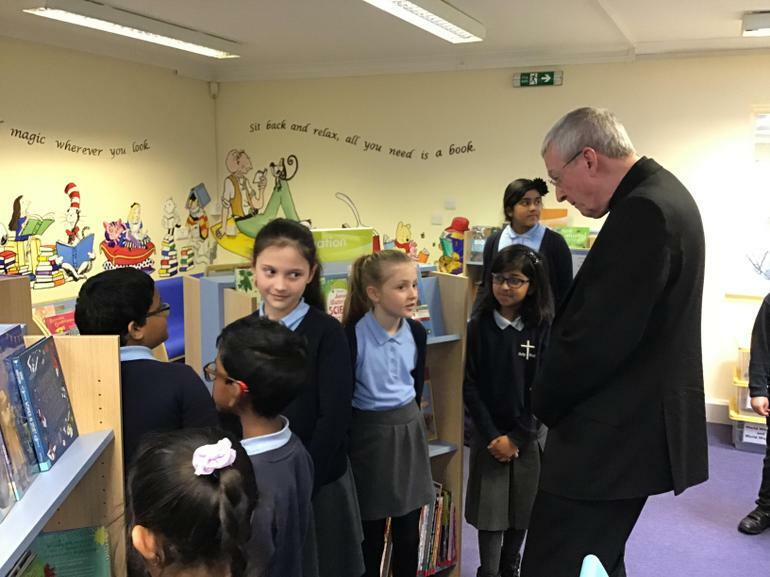 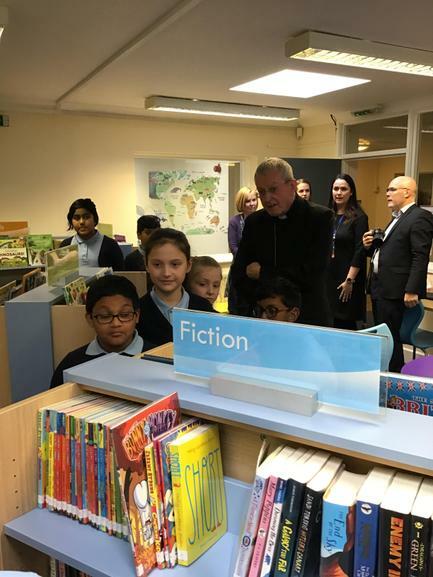 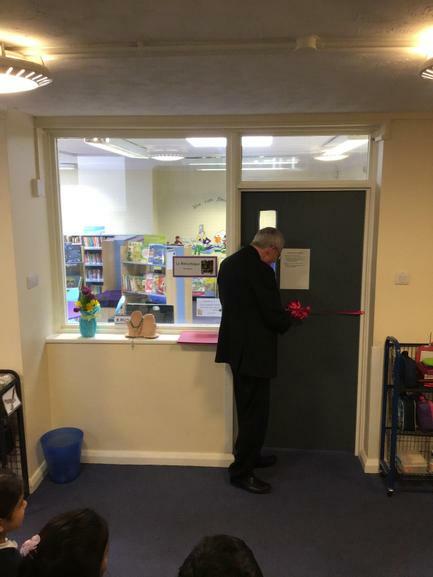 He opened the new Library and met with the School Chaplaincy Team. 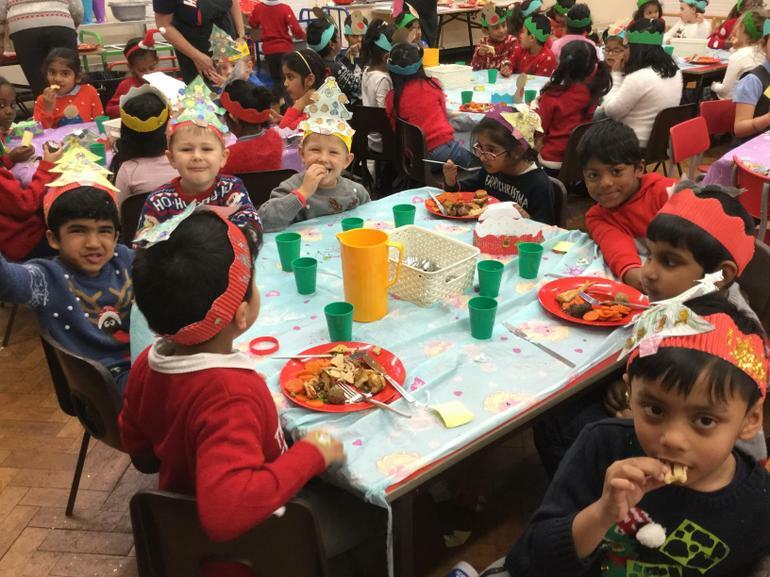 We all had lovely day. 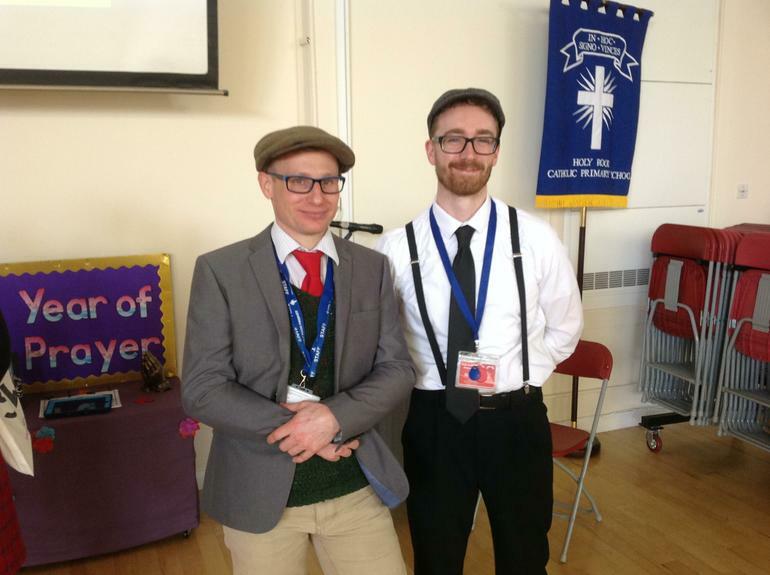 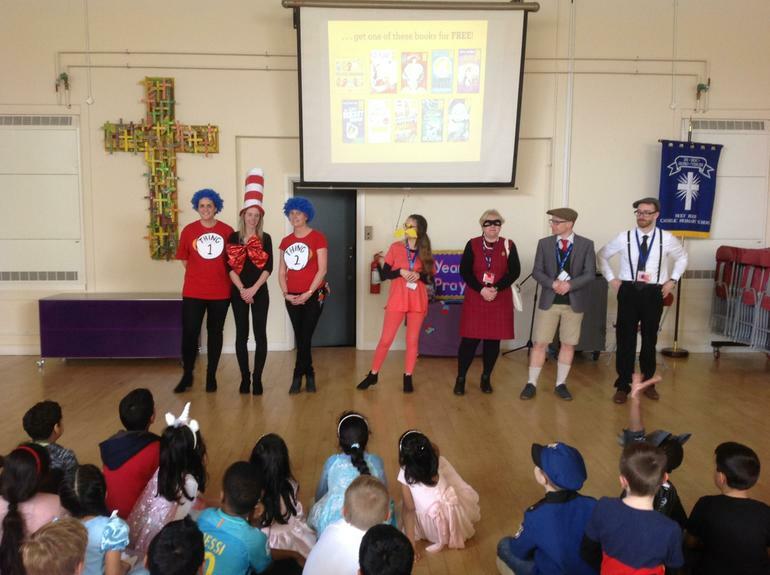 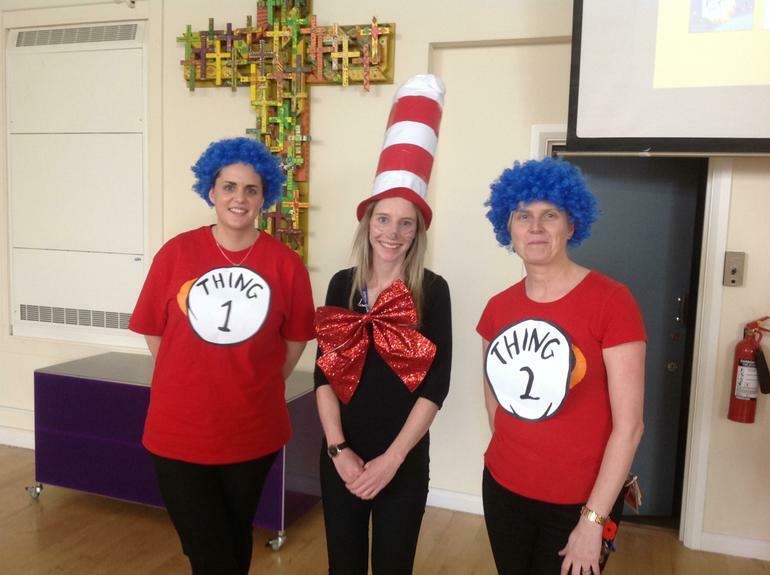 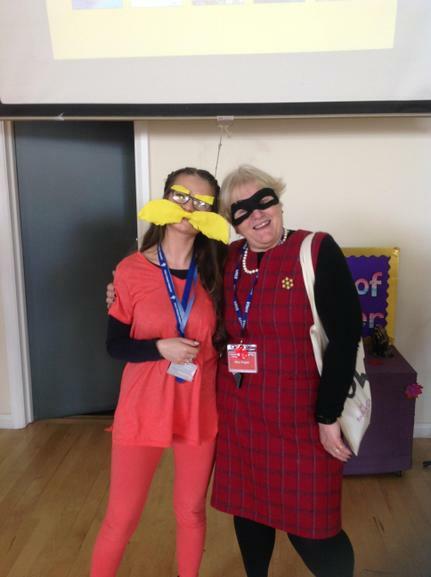 KS2 Teachers enjoyed dressing up for World Book Day. 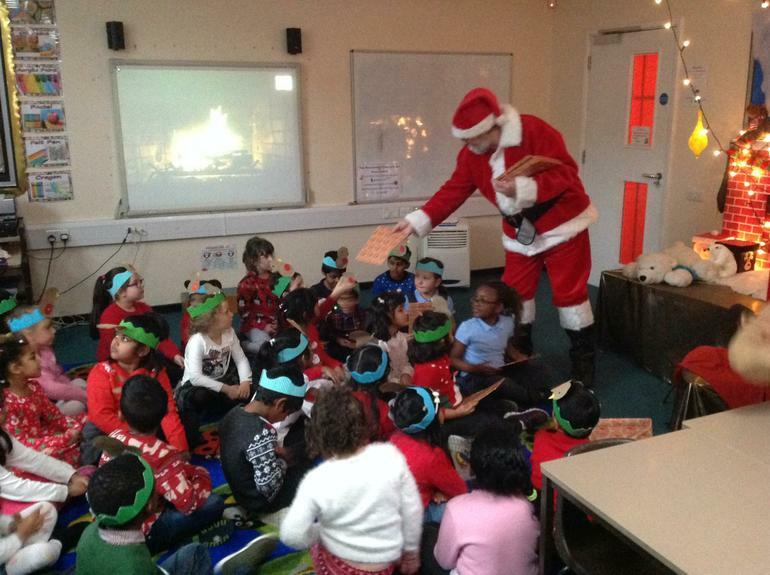 Look at the class pages to see how much the children enjoyed the day. 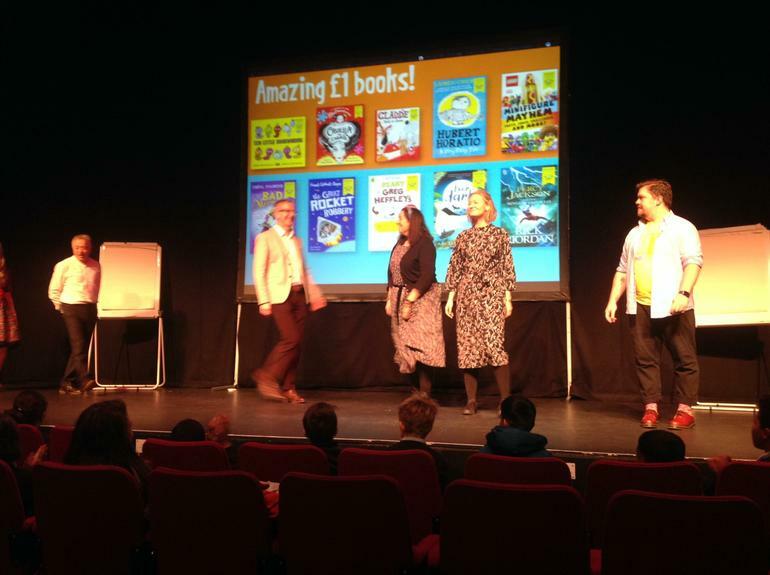 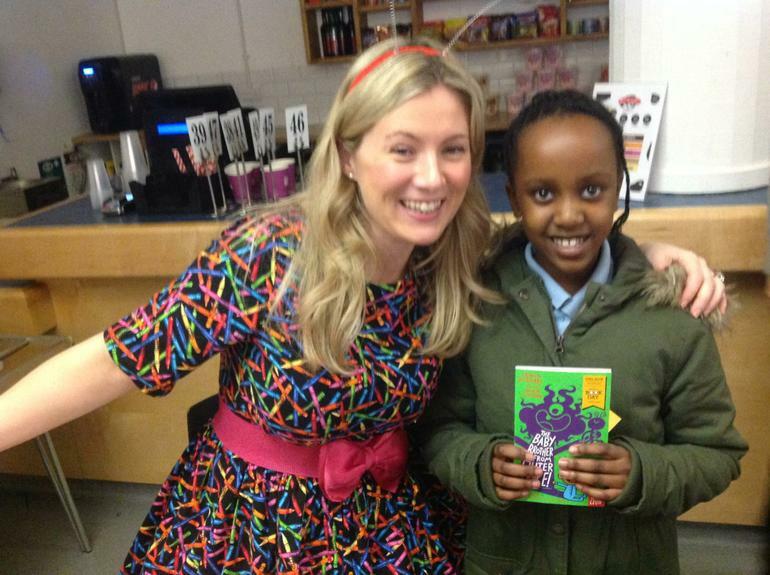 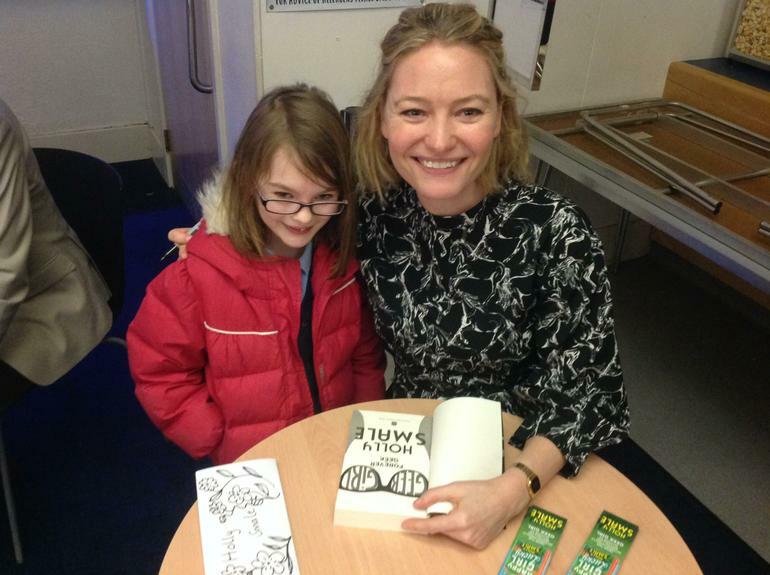 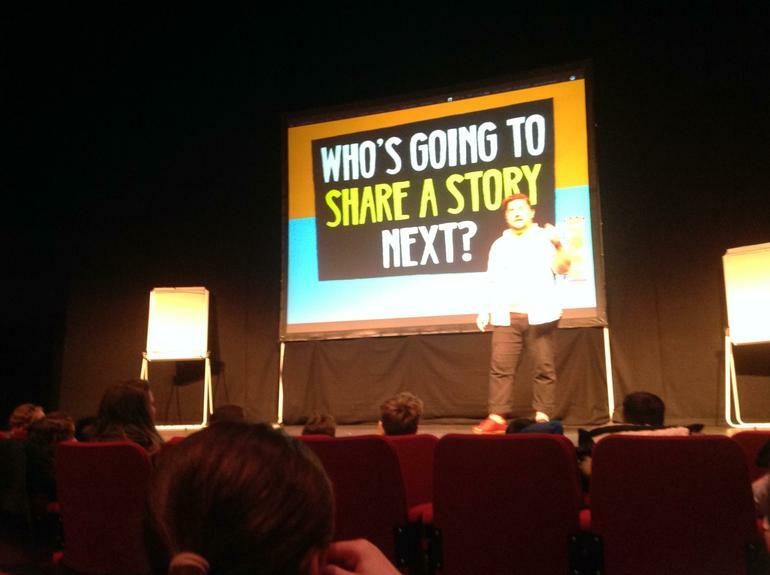 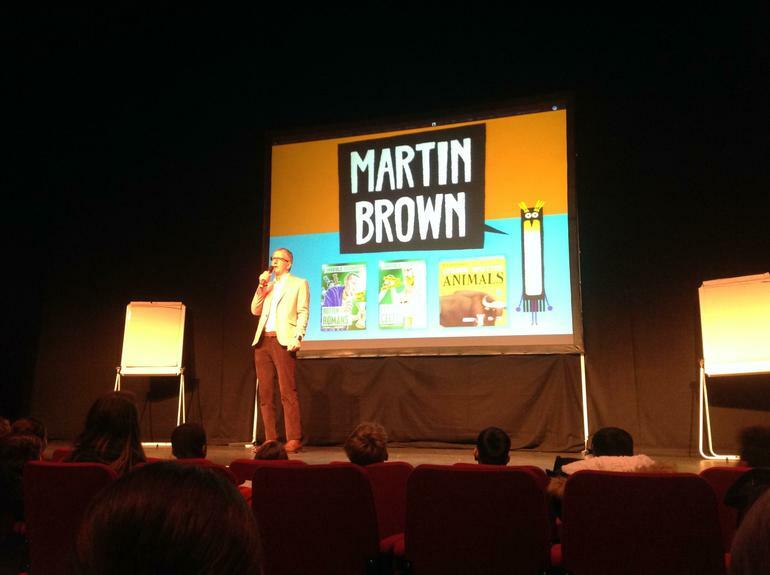 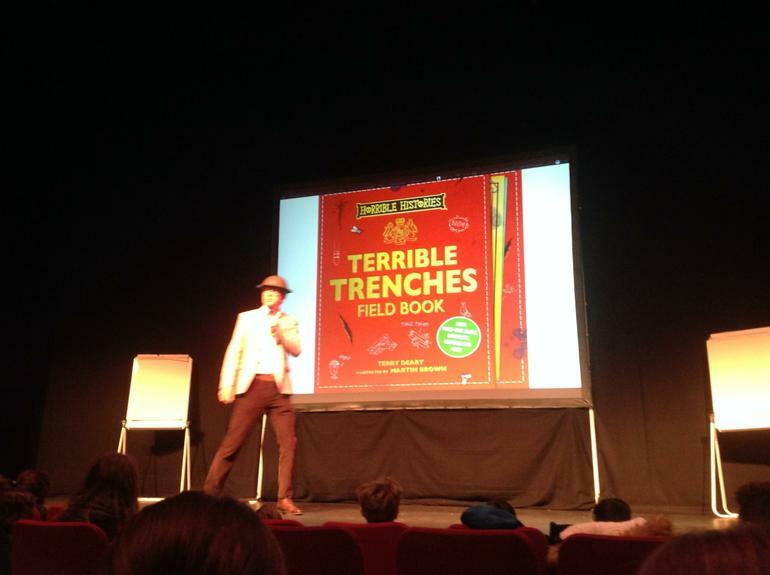 Share a Story Live - Children from KS2 had a fantastic time at the Wyvern Theatre today listening to different authors and illustrators talking about their books as part of our World Book Day celebrations. 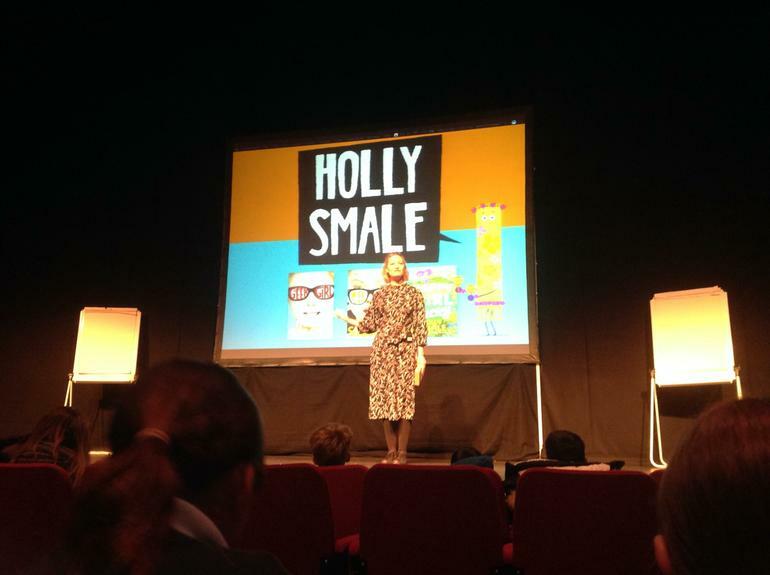 It certainly was an inspirational morning! 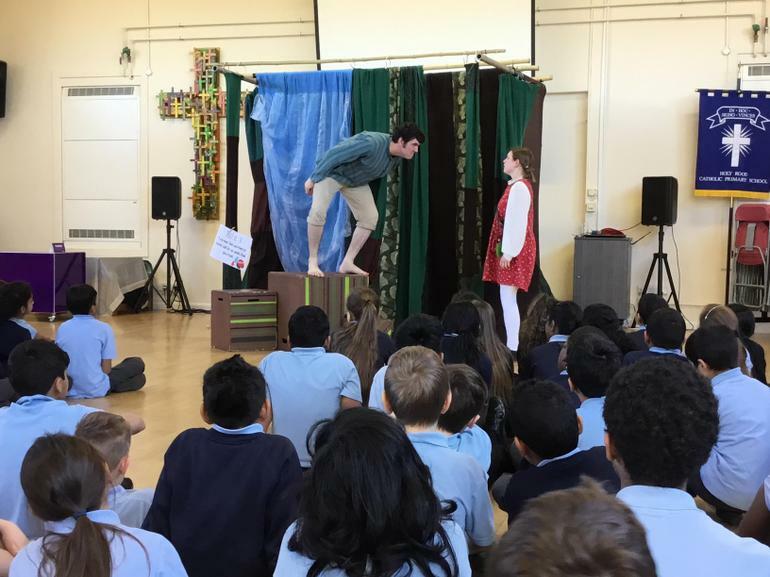 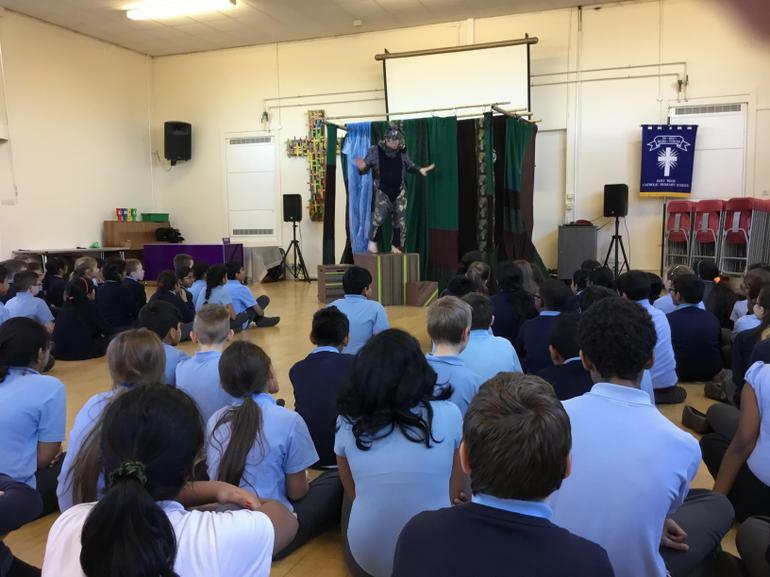 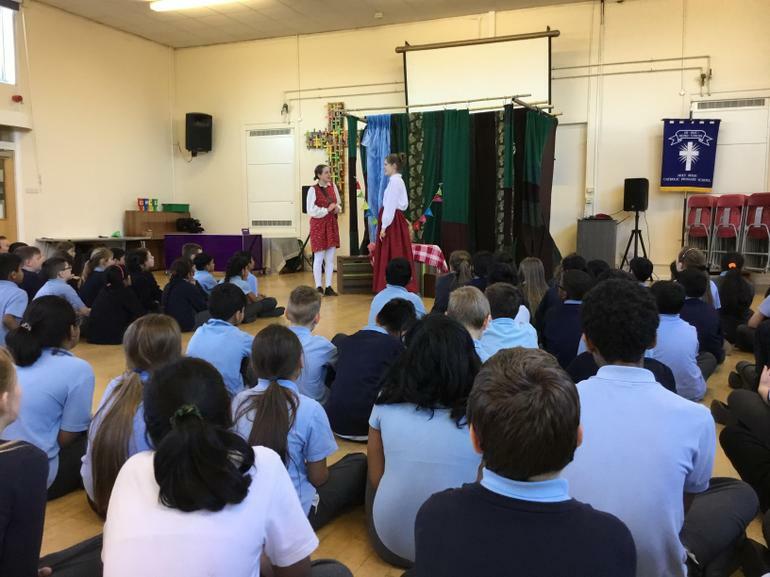 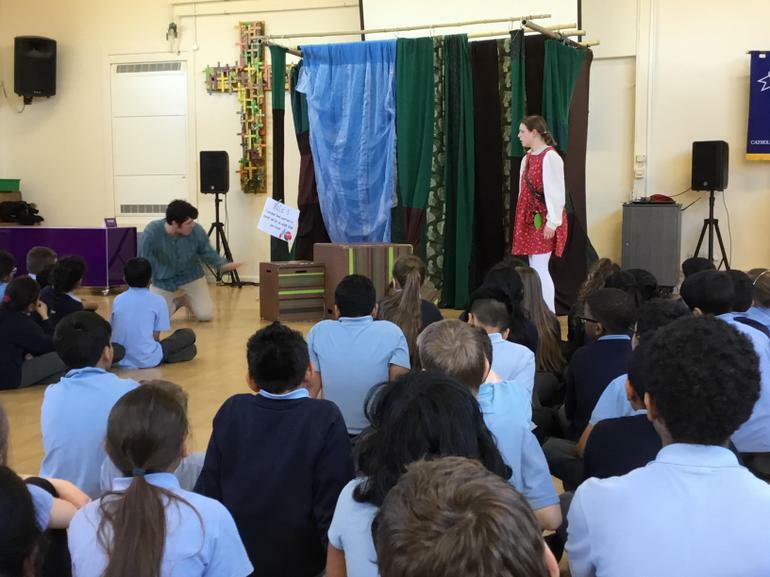 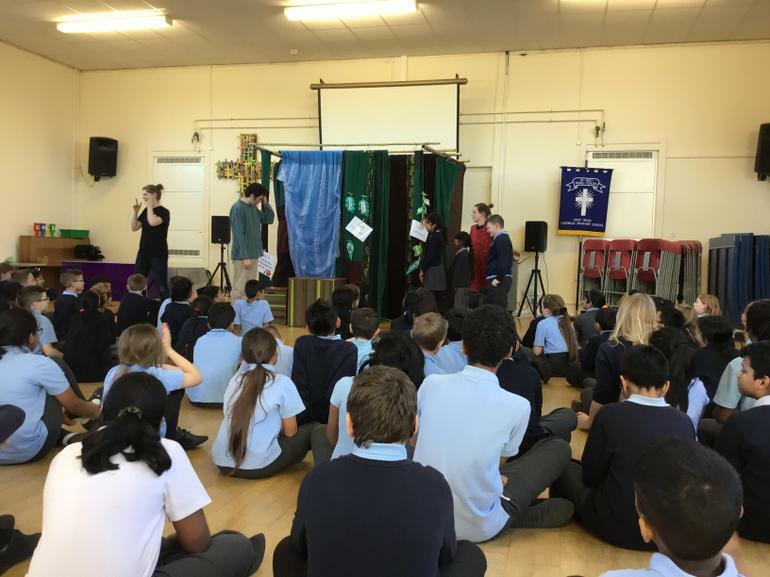 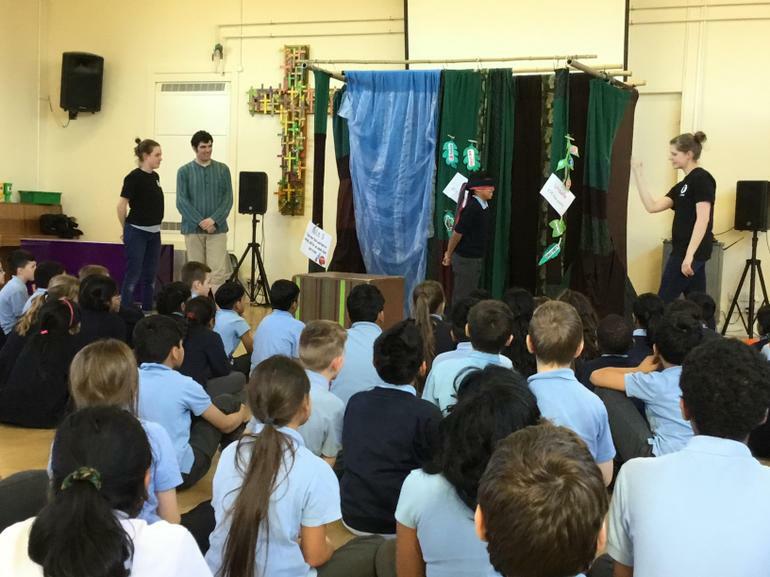 ‘Escape’ - KS2 enjoyed a visit from Saltmine Theatre Company who performed a play all about the importance of staying safe online. 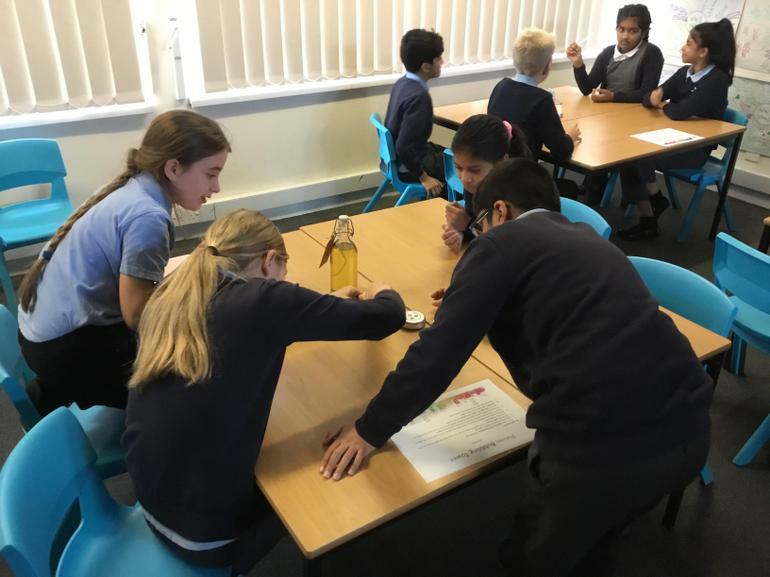 We learnt the 3 important rules for keeping ourselves safe when using the internet – why don’t you check to see if we can remember them? 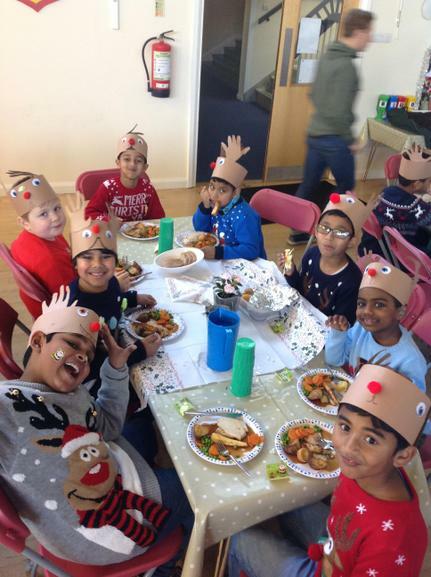 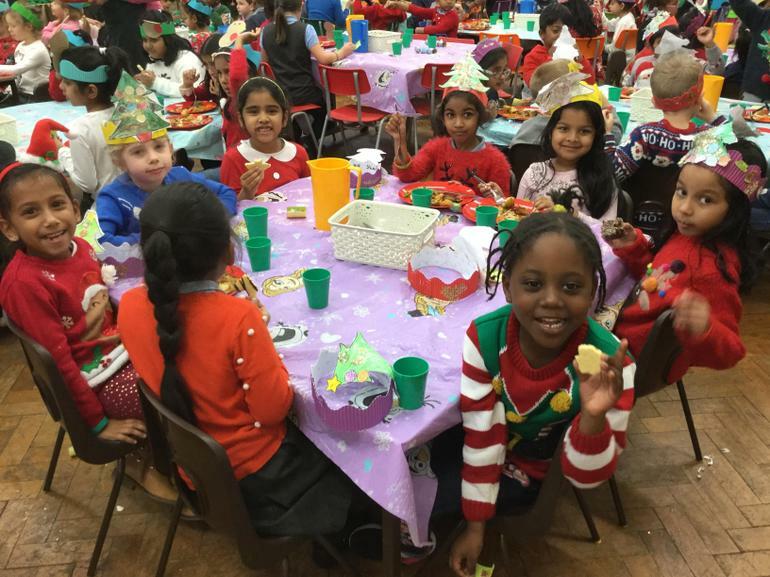 Christmas Lunch and Jumper Day. 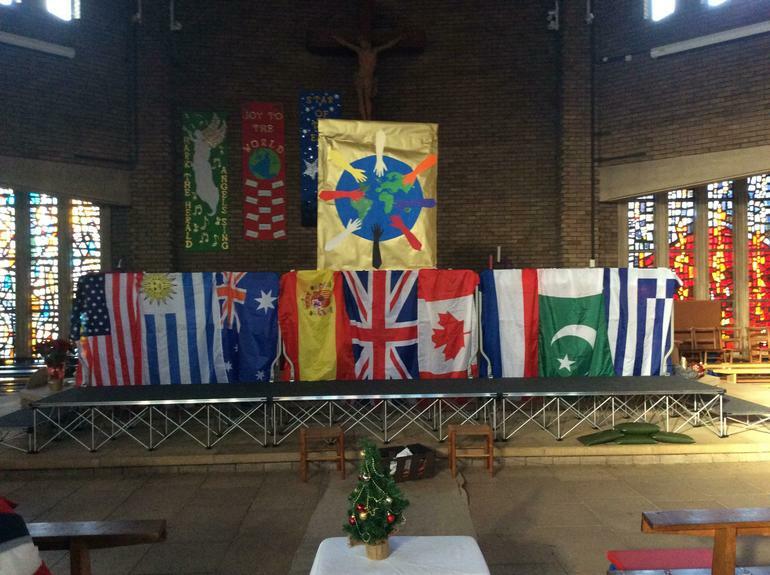 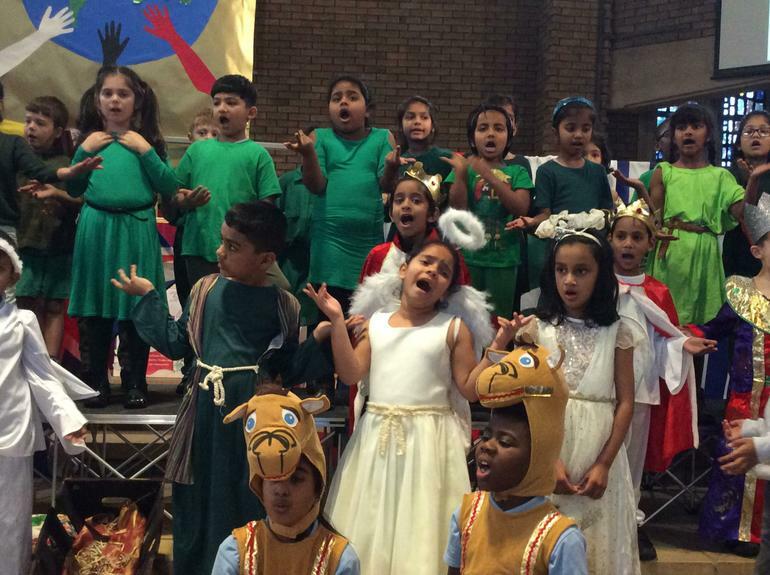 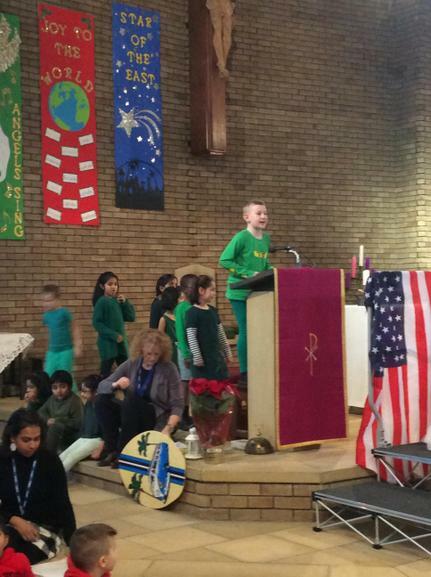 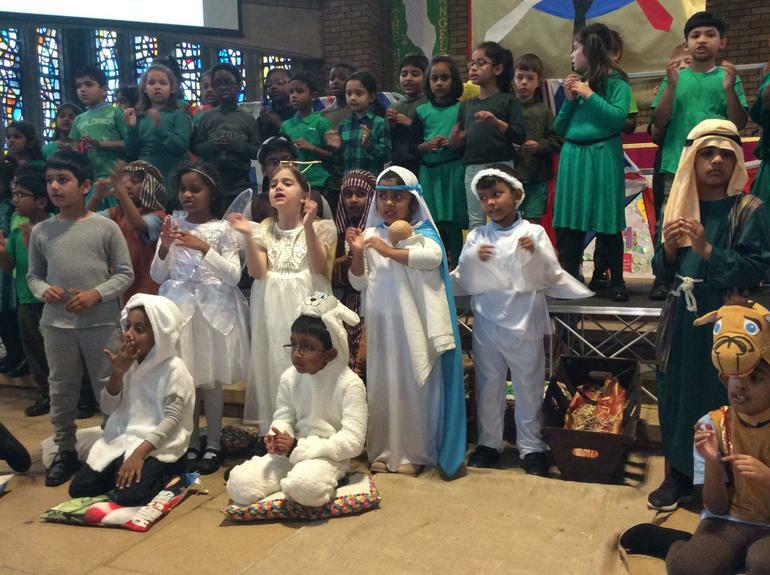 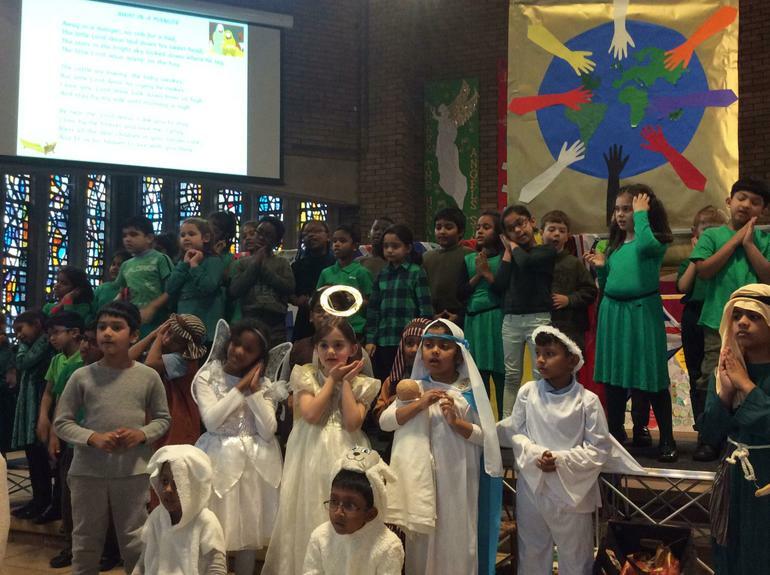 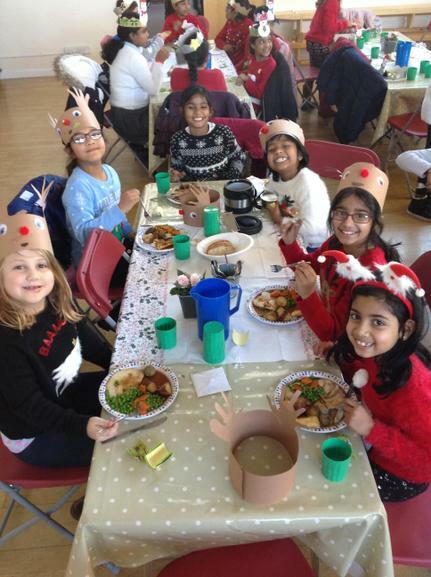 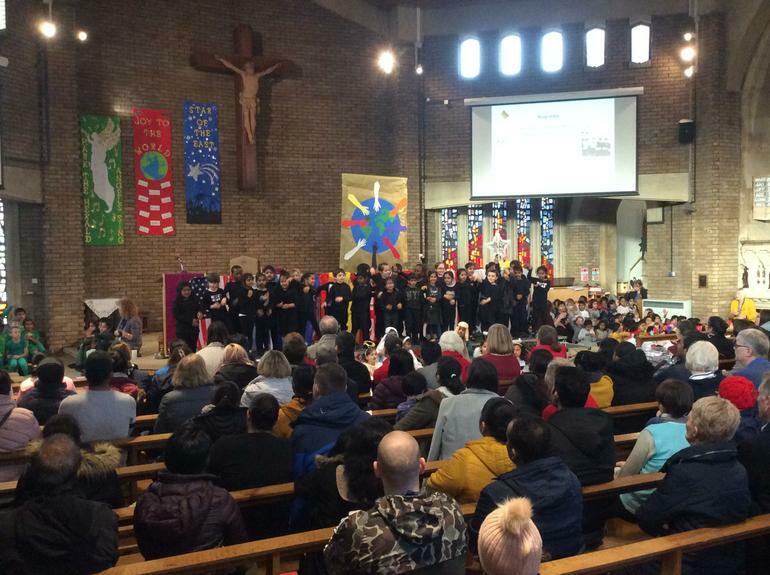 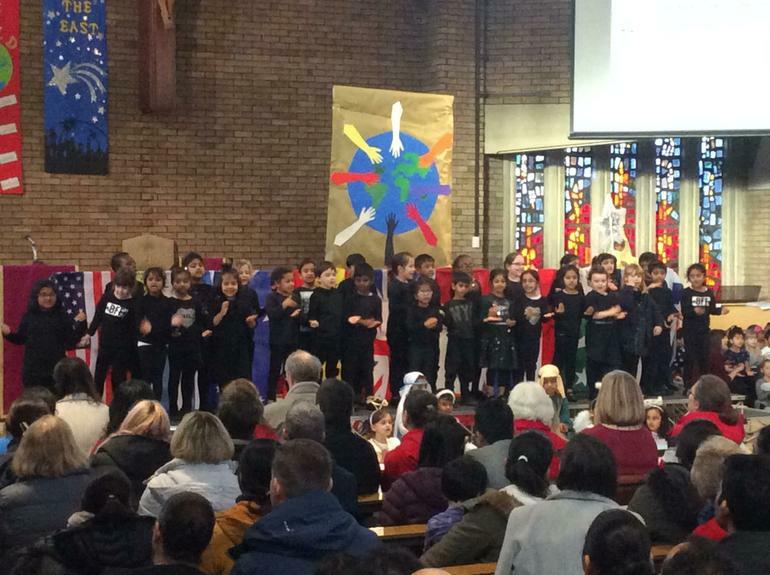 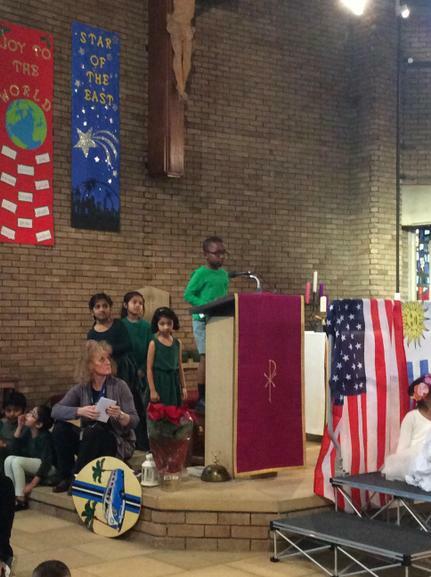 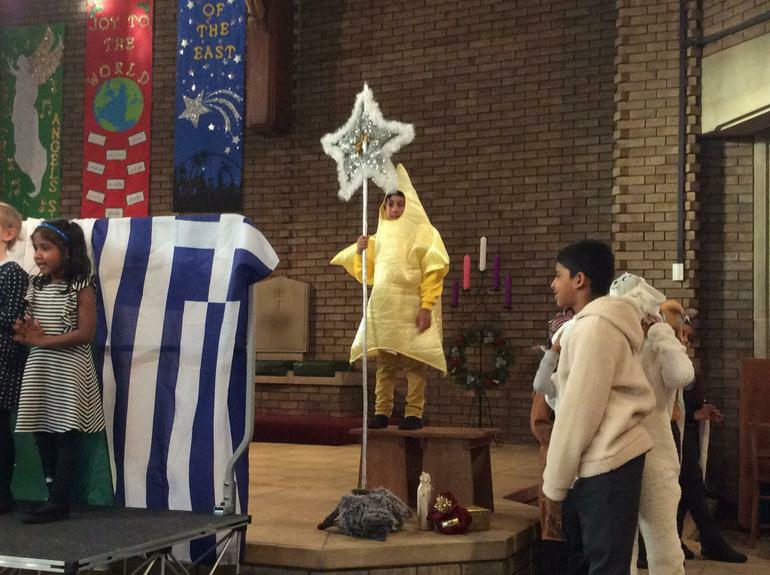 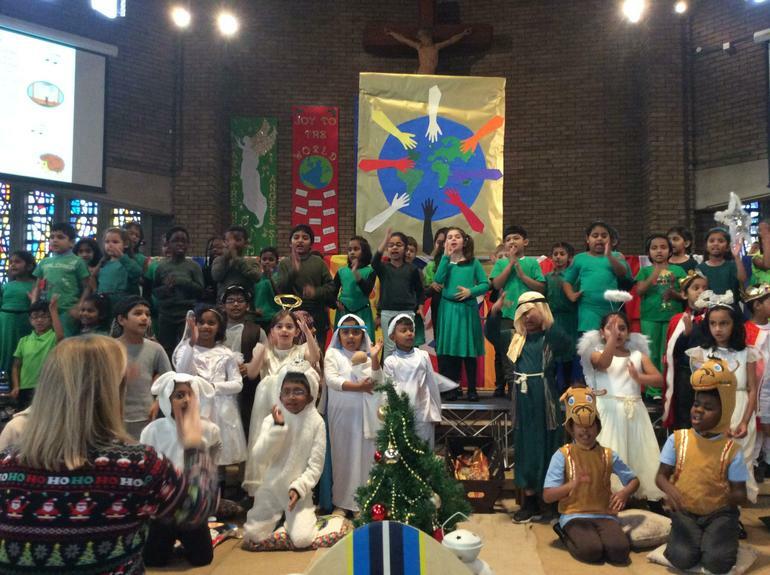 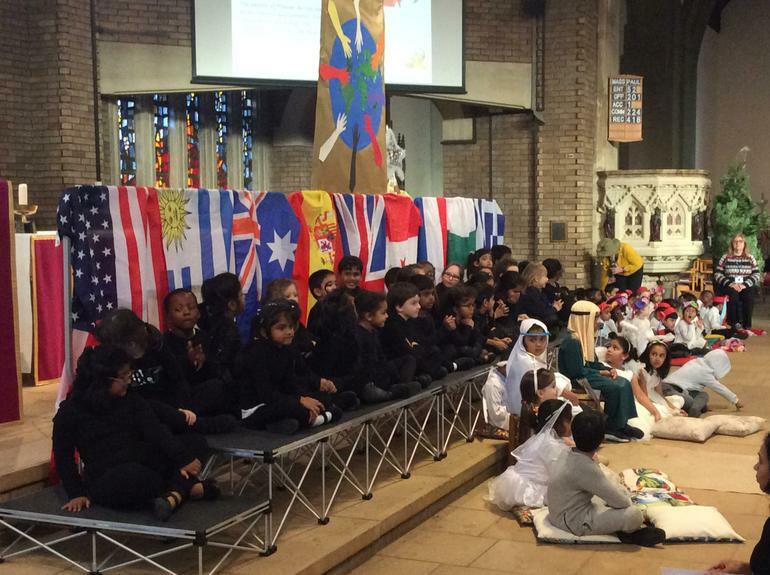 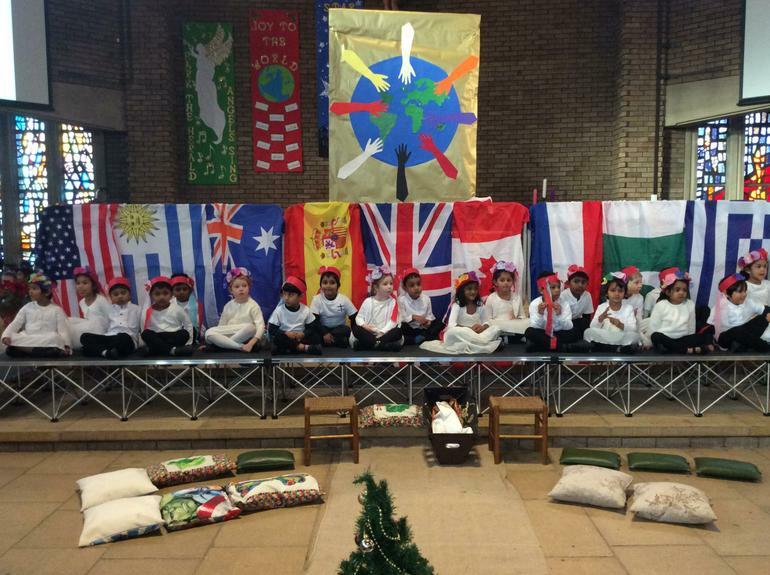 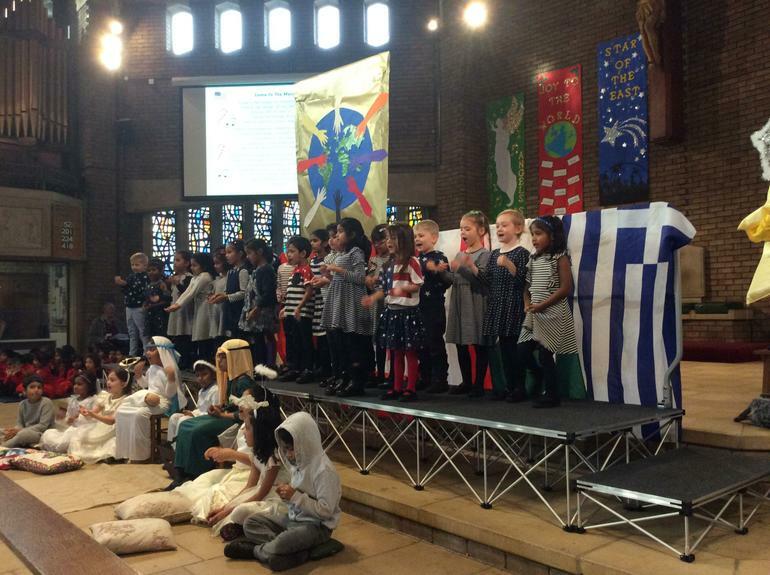 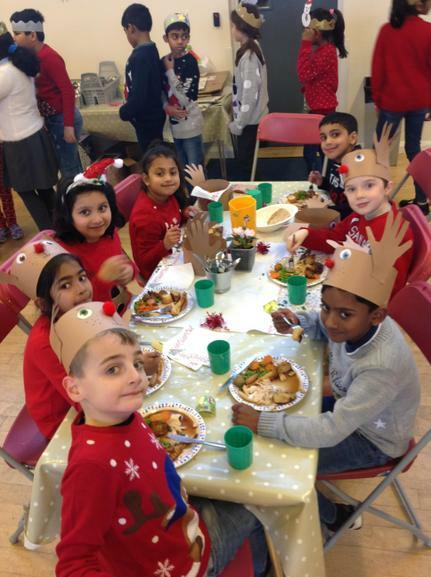 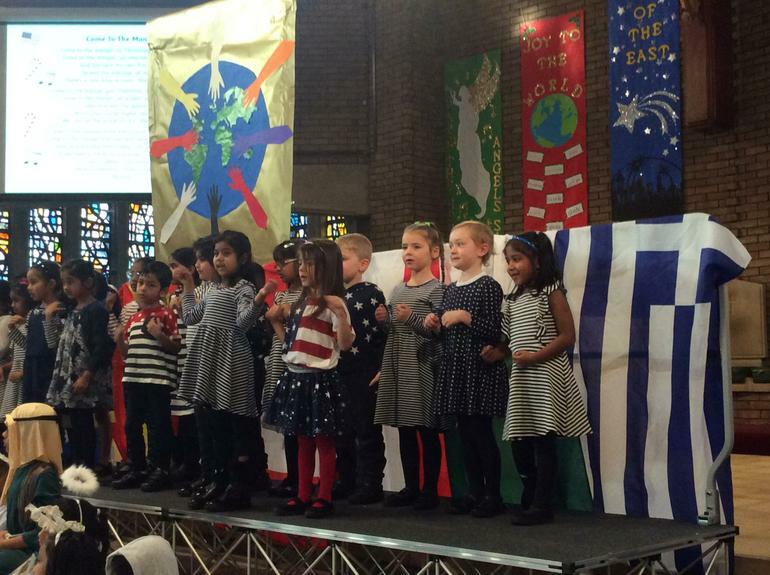 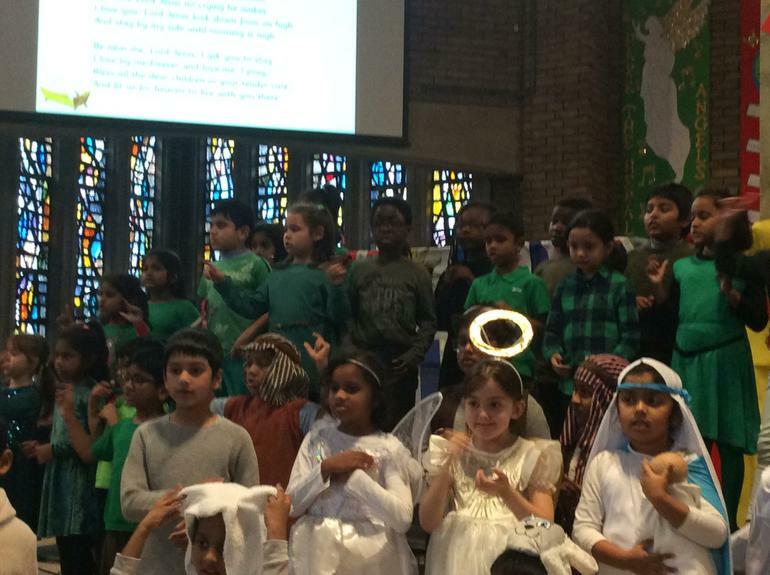 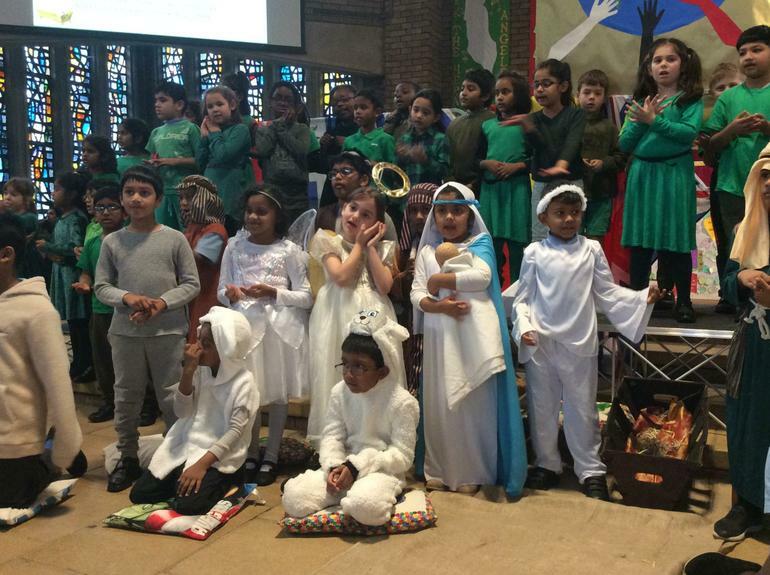 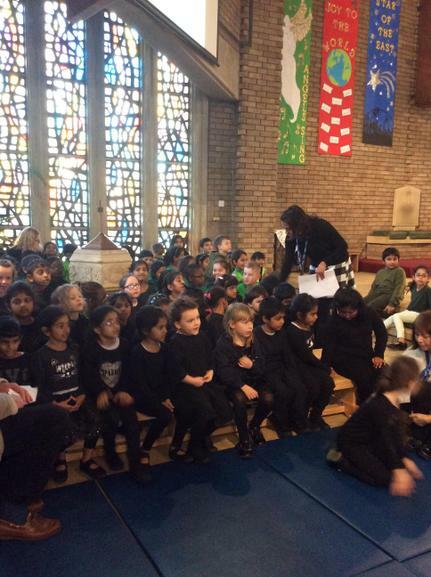 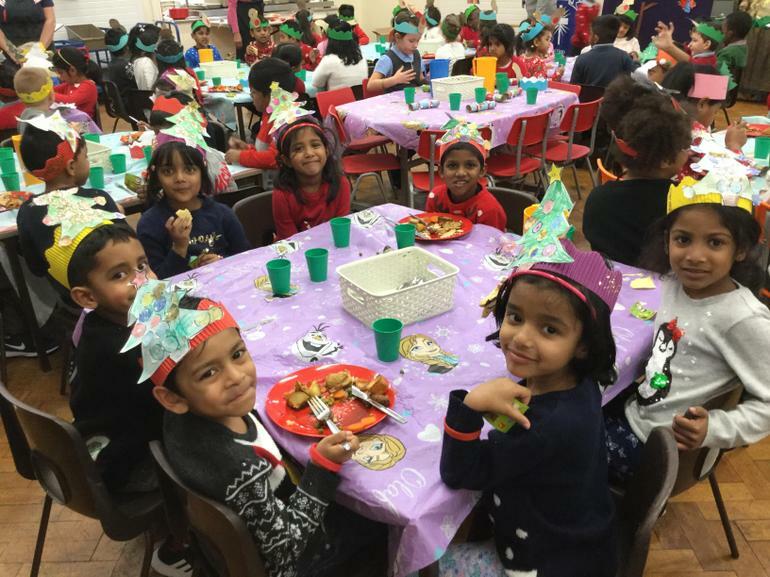 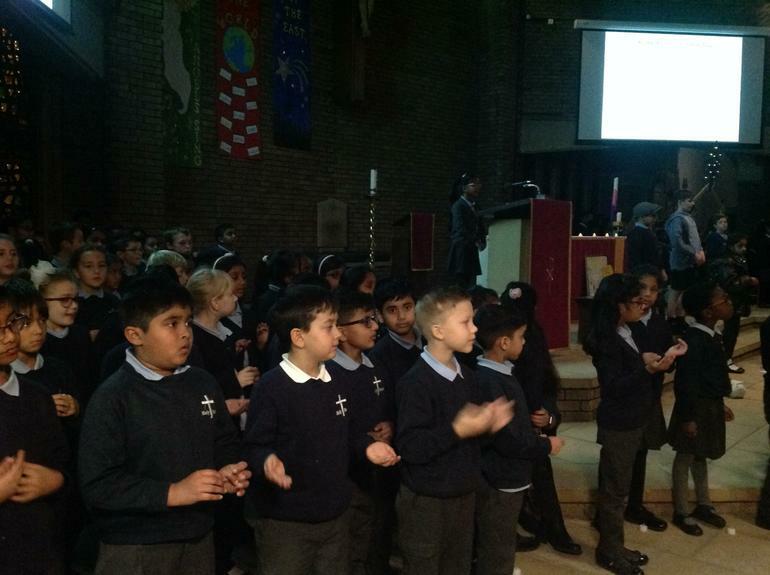 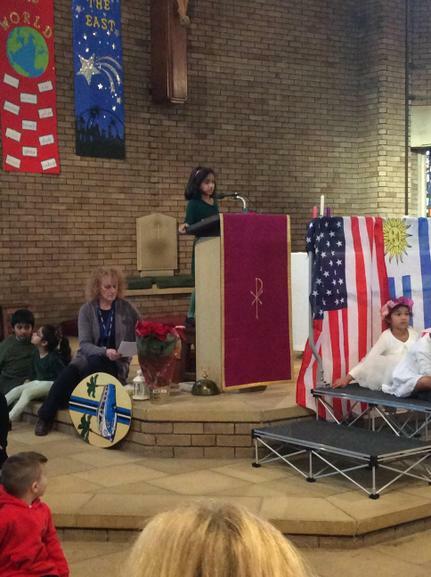 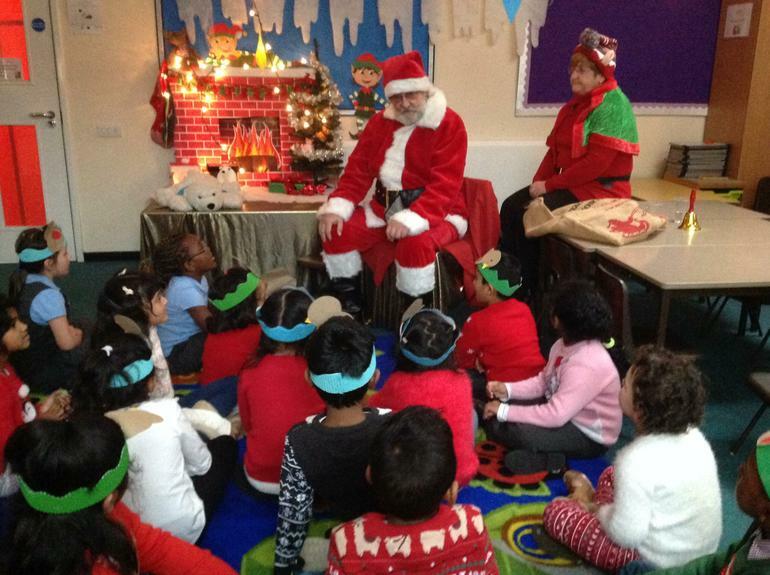 Thank you to everyone who attended the KS2 Christmas Celebration. 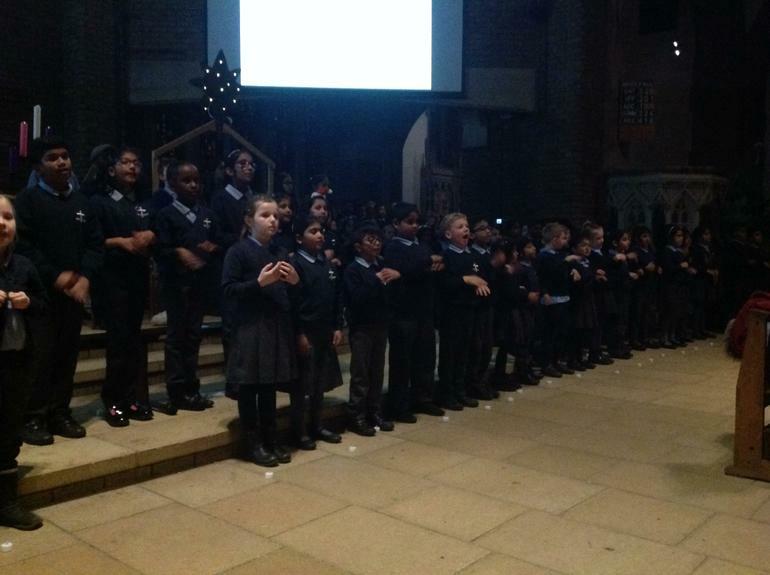 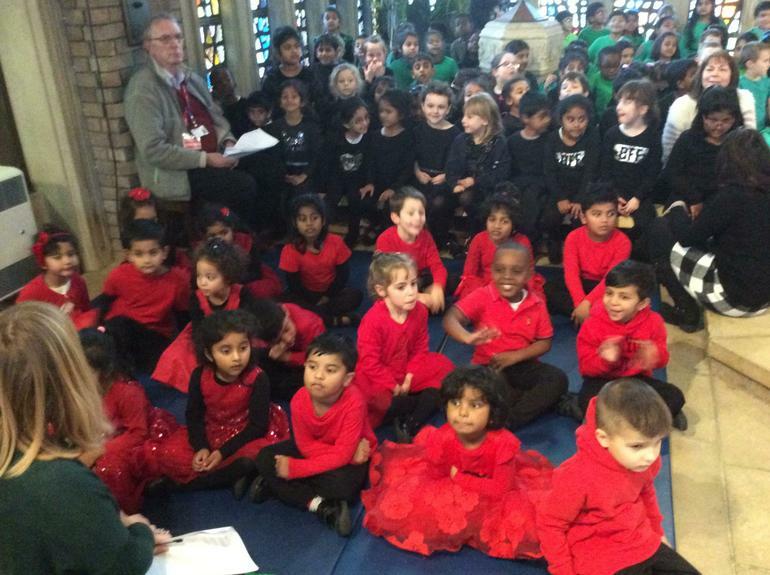 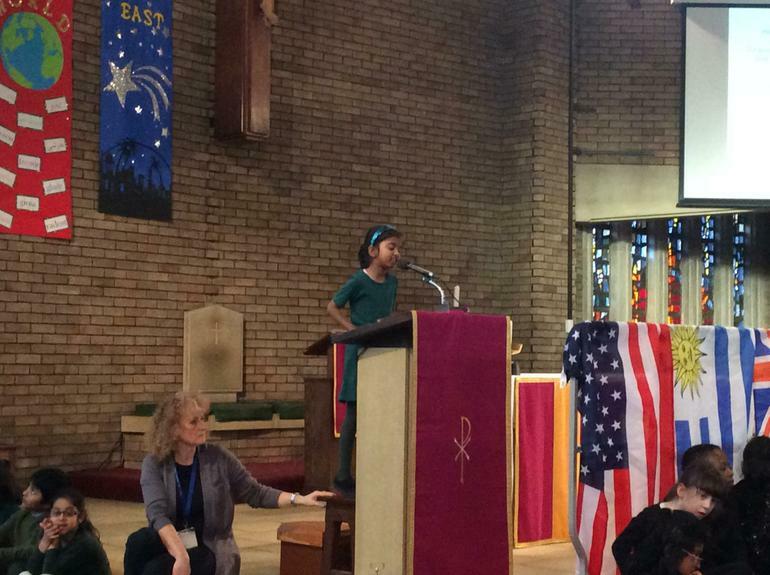 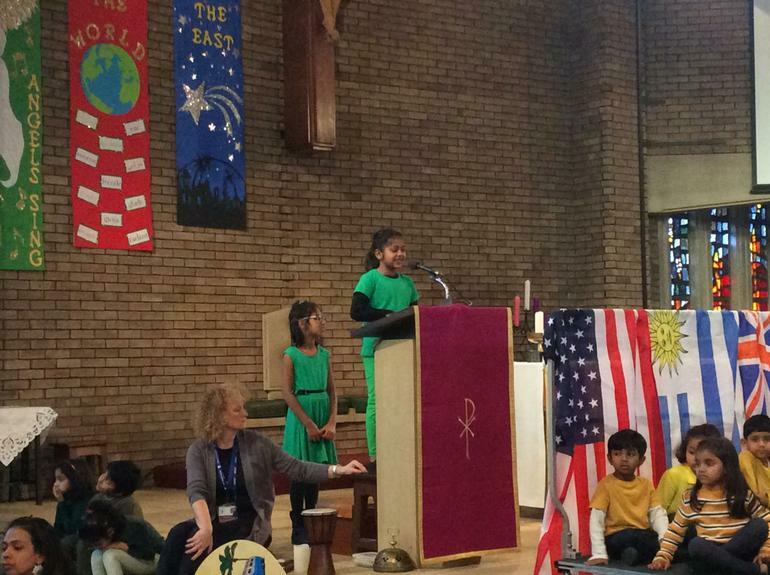 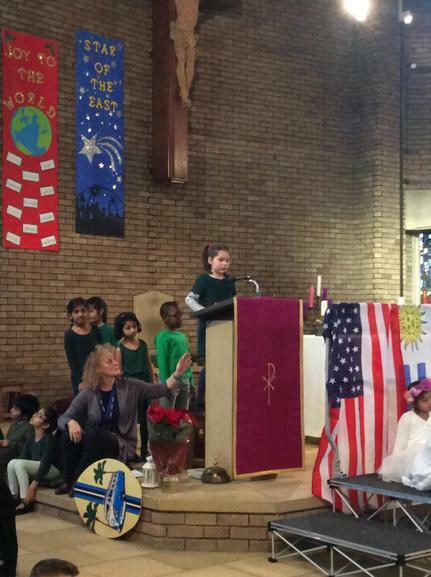 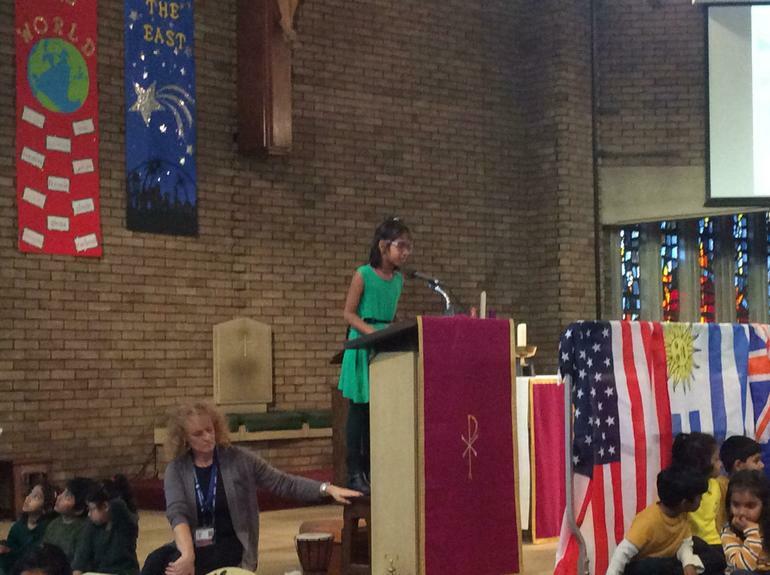 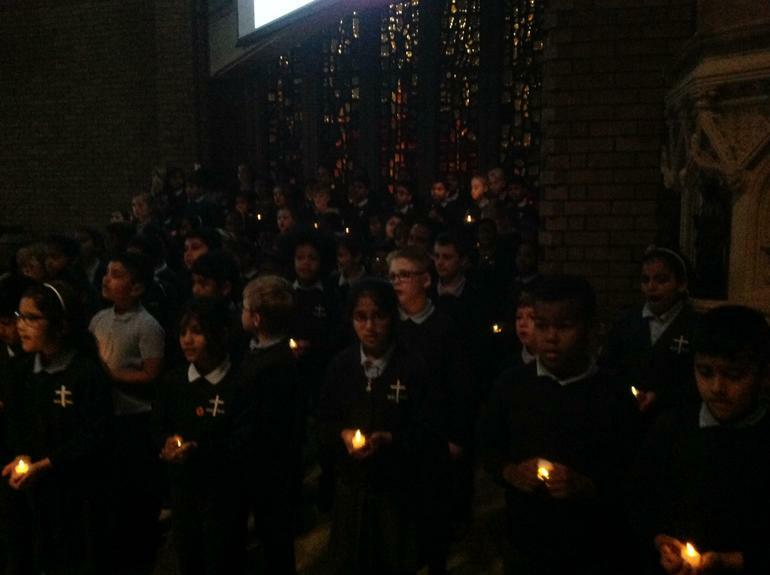 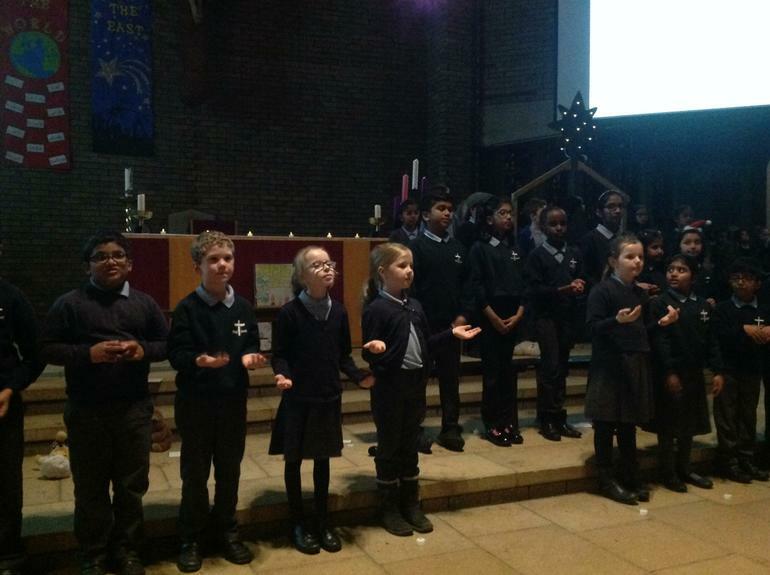 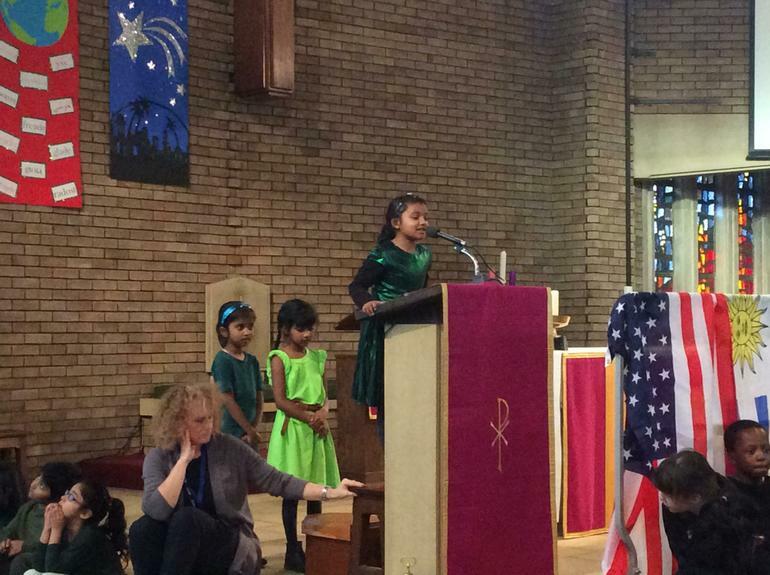 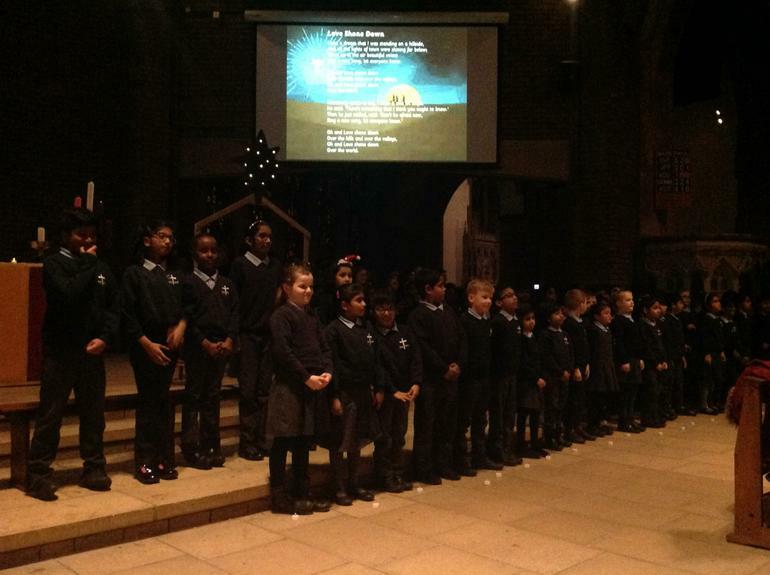 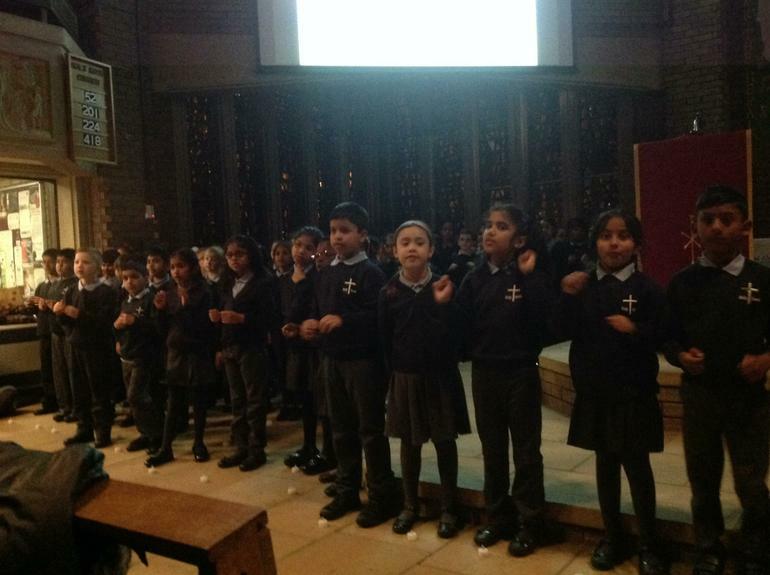 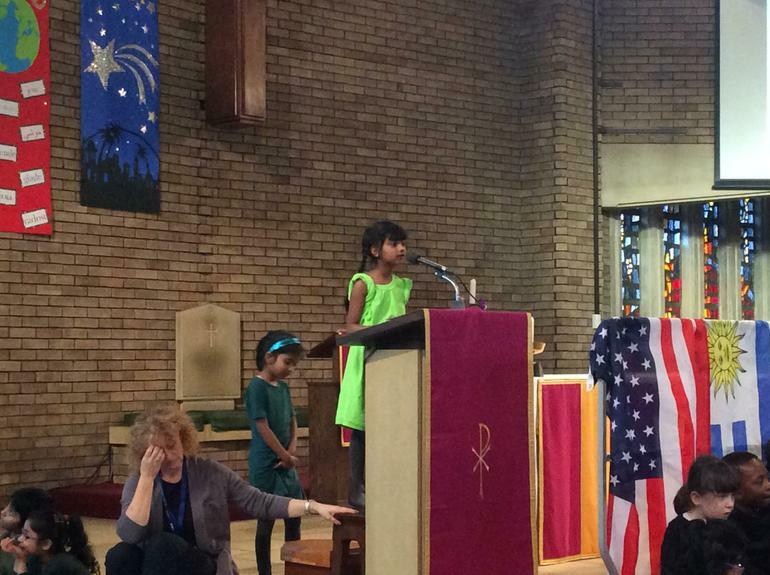 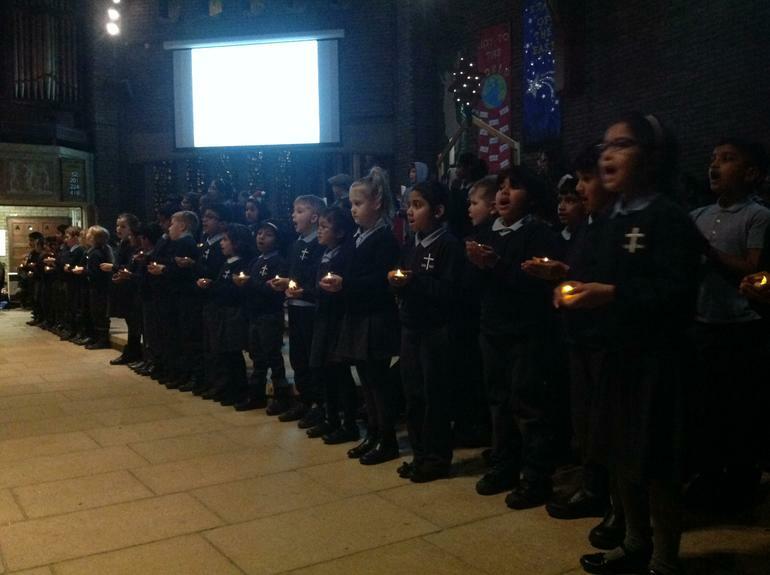 The children sang beautifully and the entire evening was wonderful. 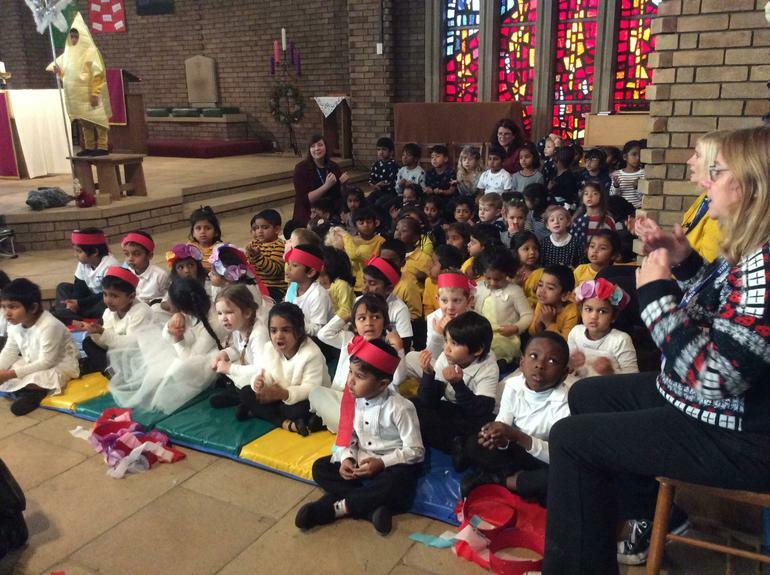 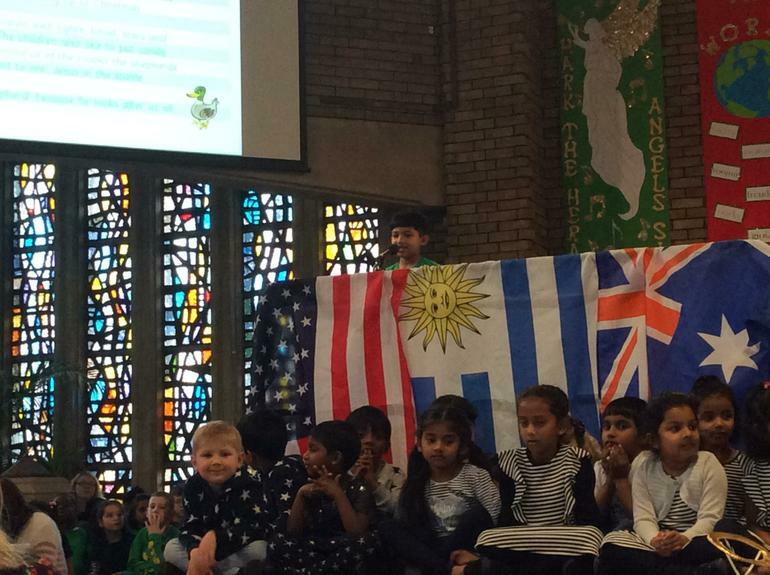 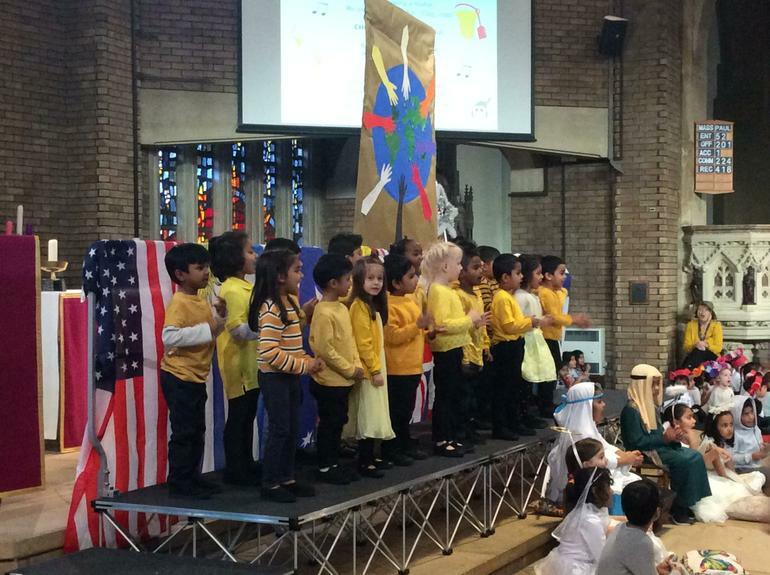 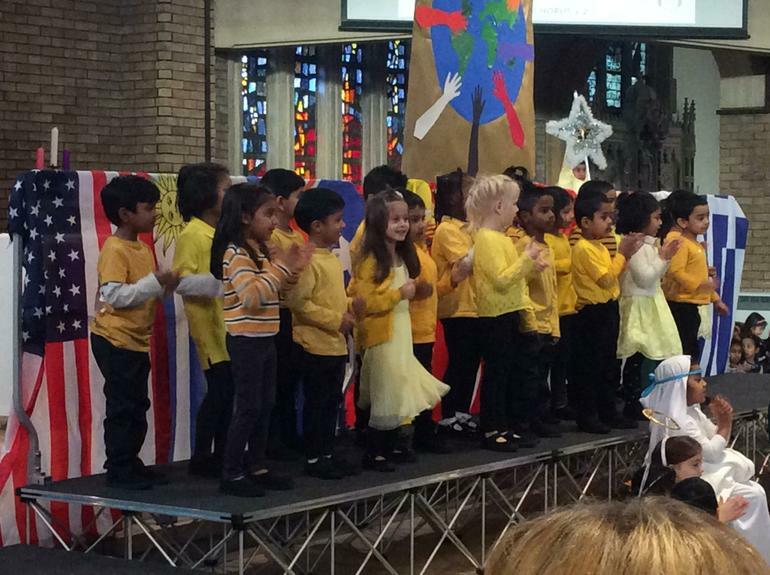 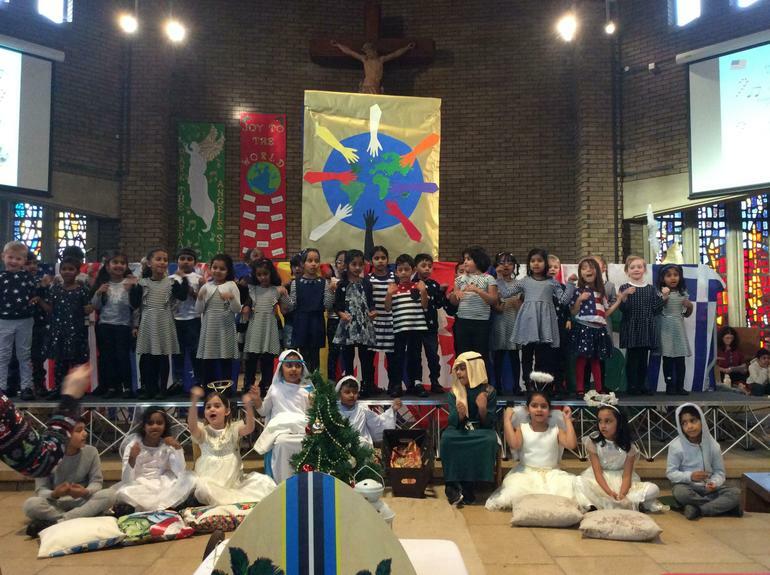 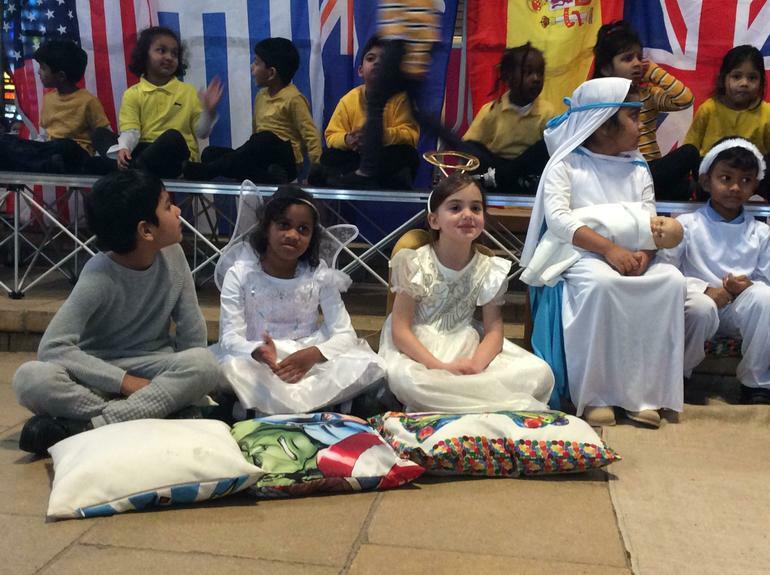 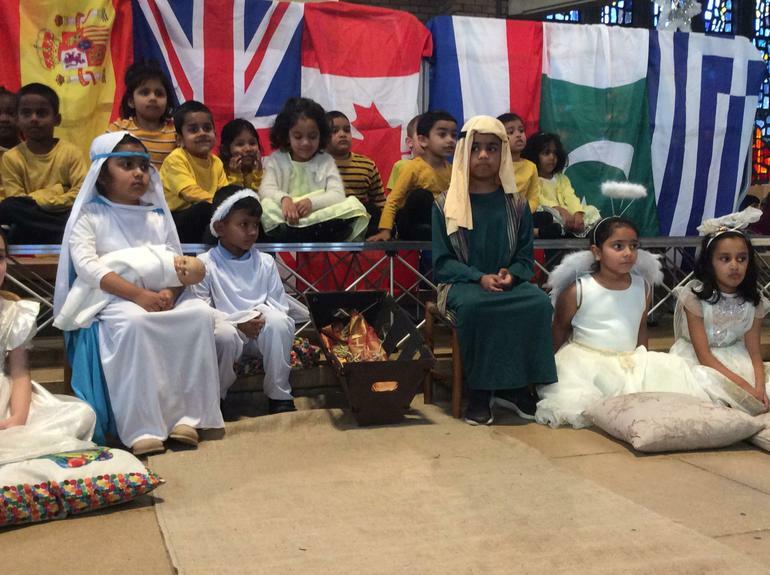 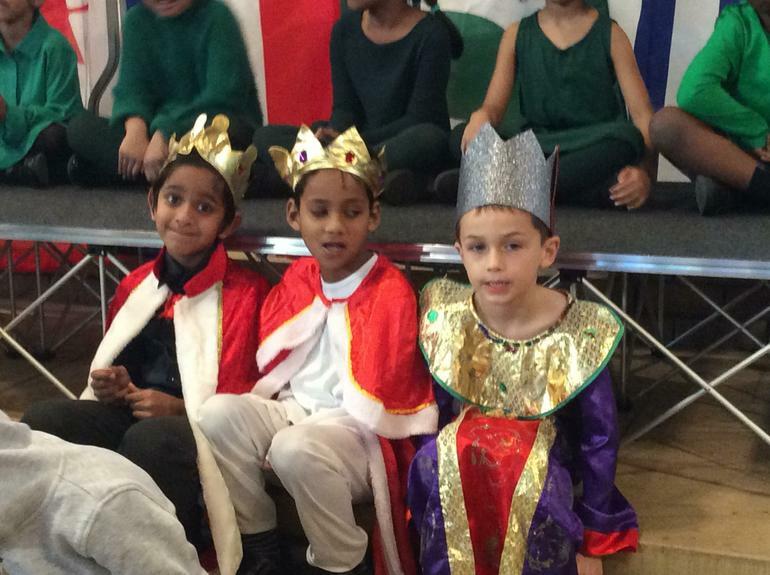 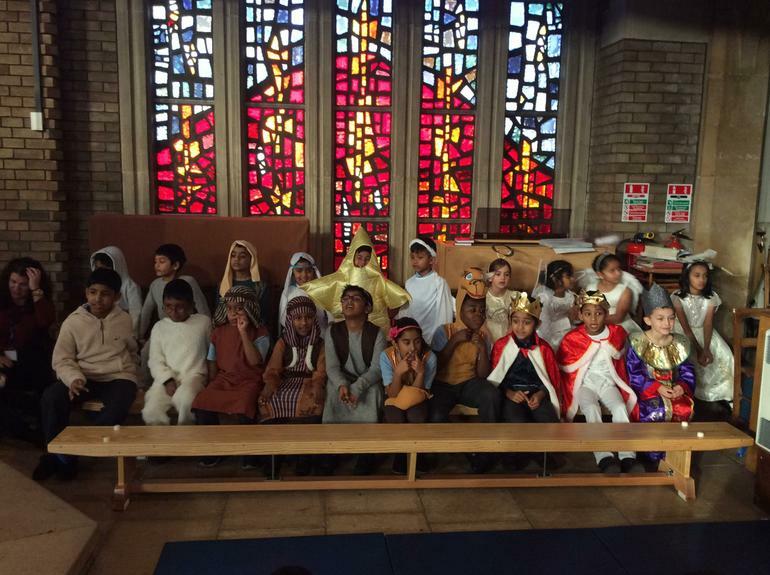 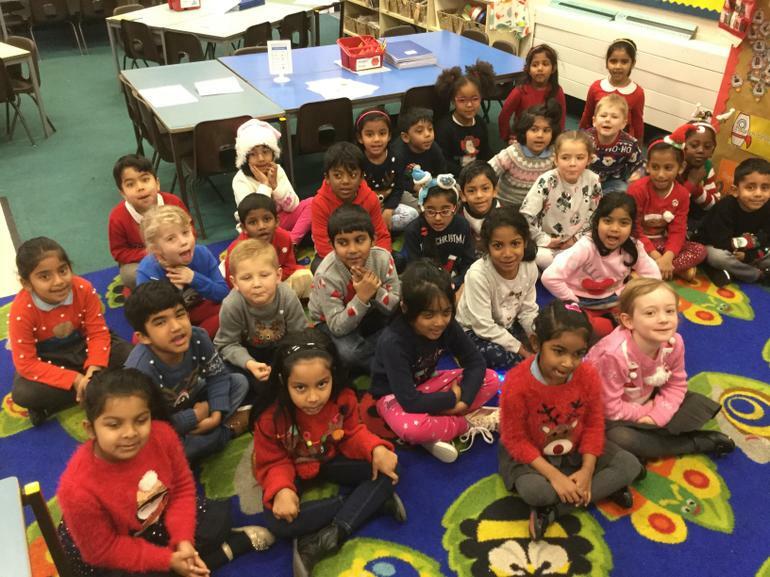 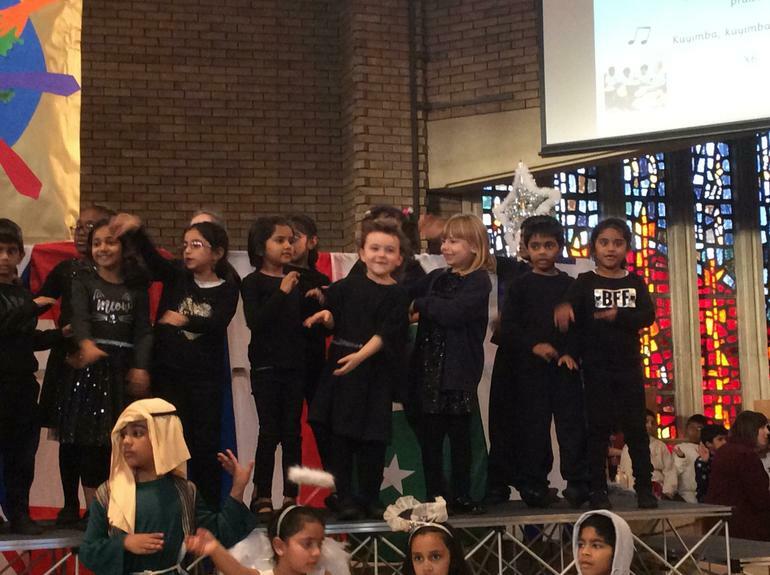 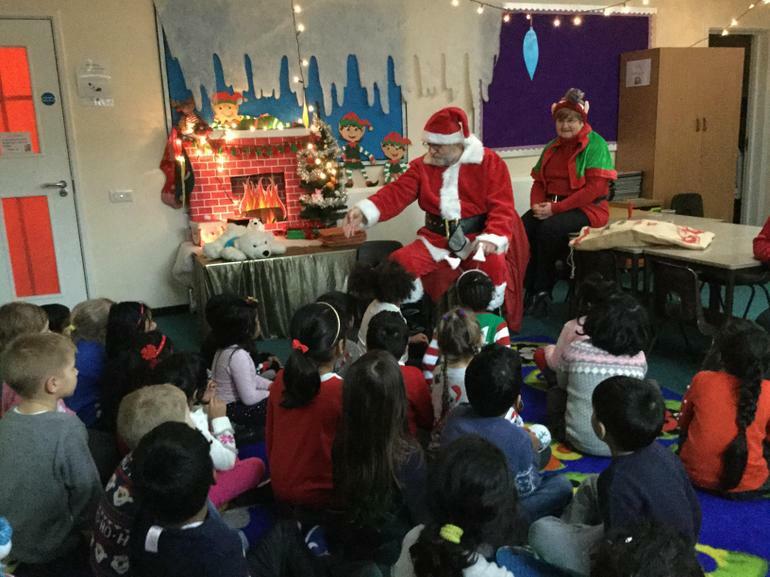 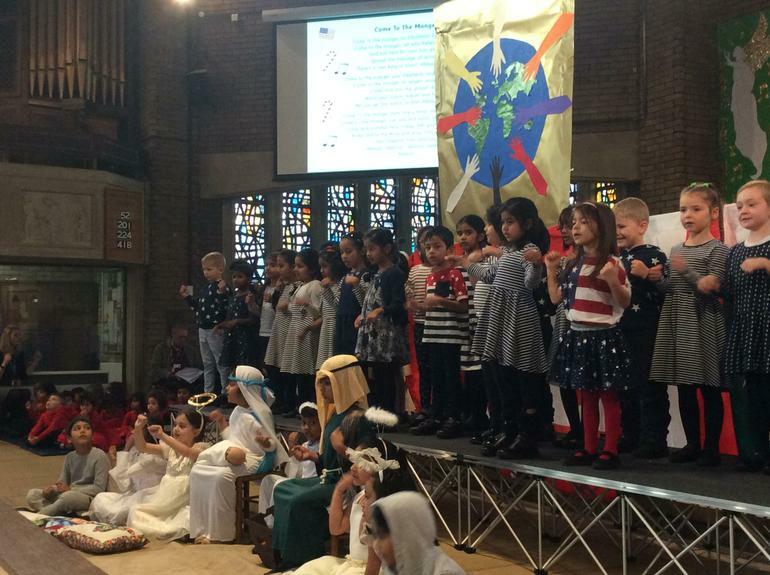 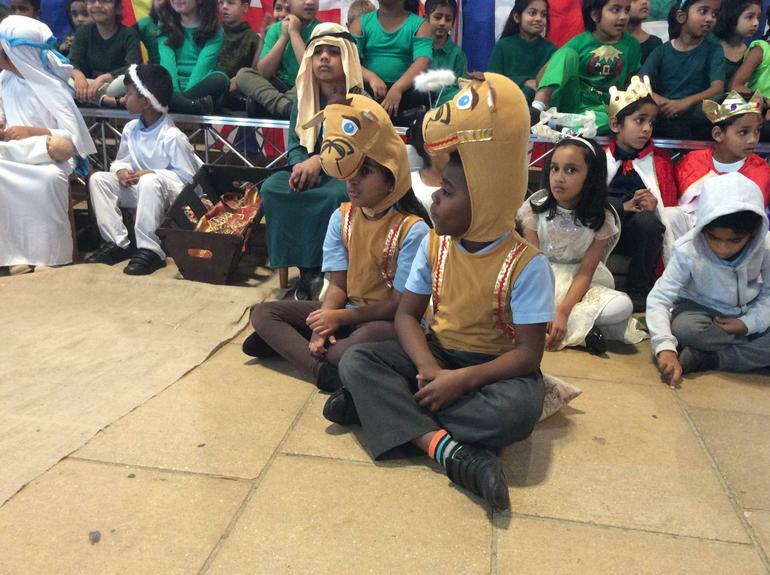 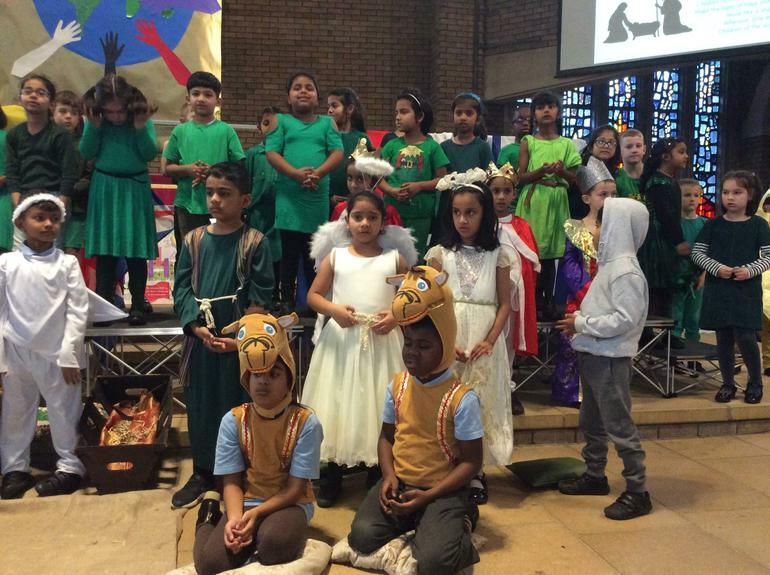 Thank you to all the parents of Reception, Year 1 and Year 2 children for providing beautiful costumes. 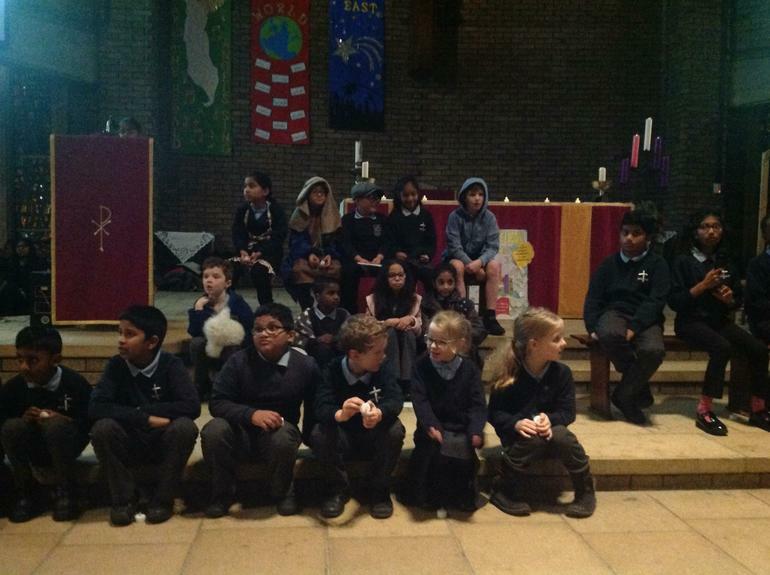 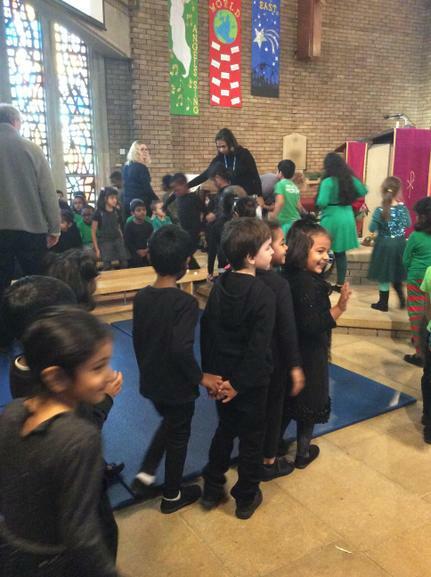 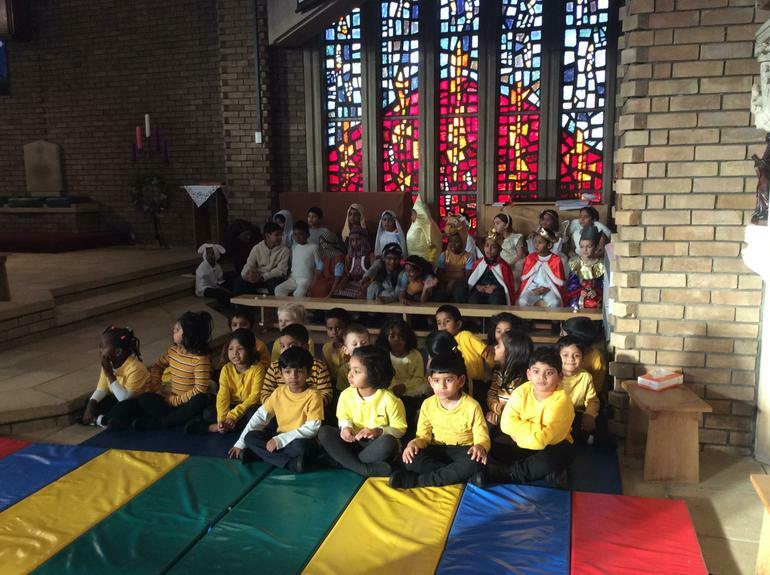 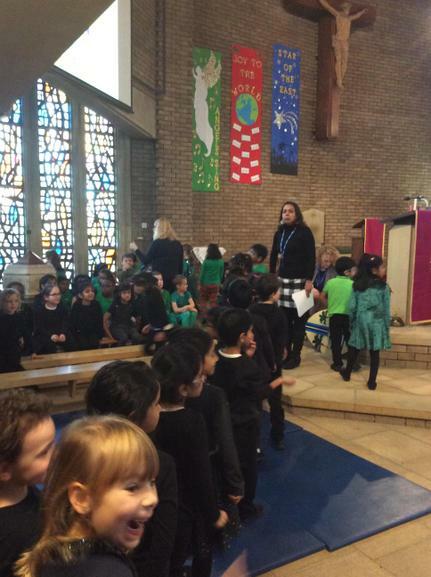 Thank you to everyone who came to the church supporting the children with their Christmas Celebration. 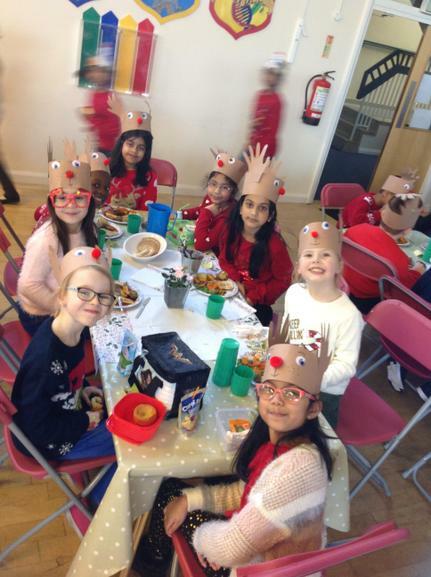 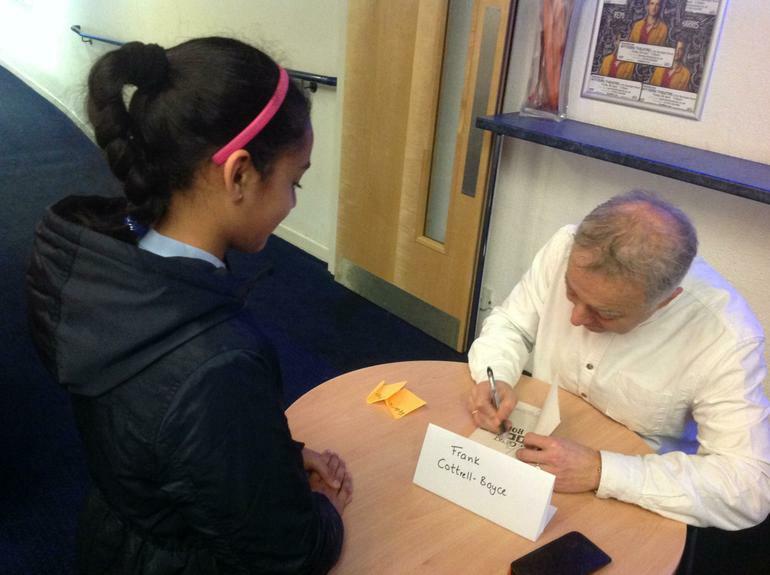 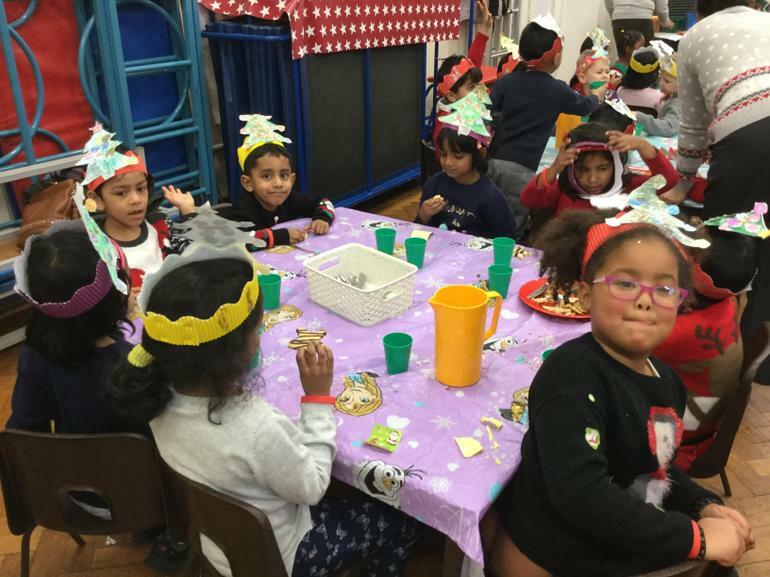 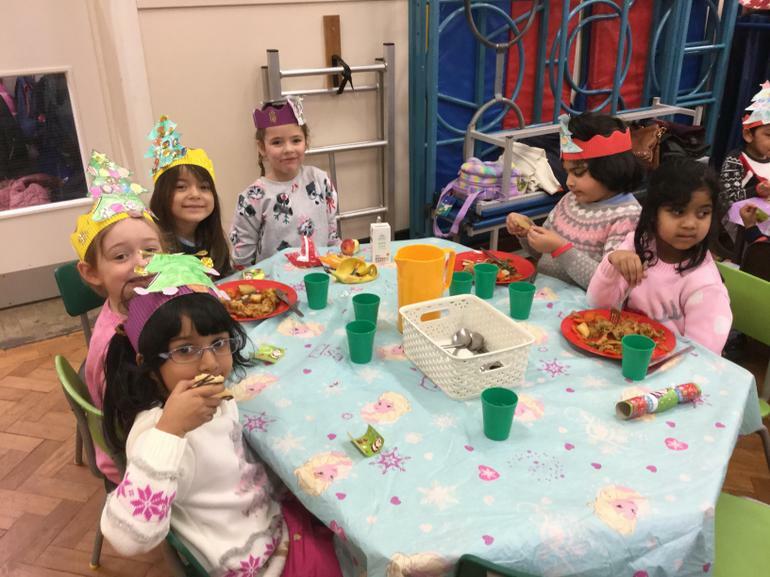 Please find below a few pictures of our wonderful event. 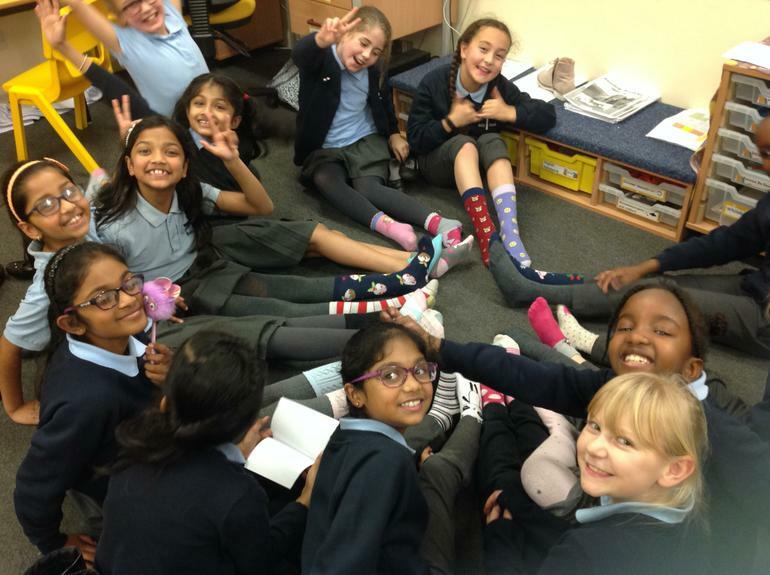 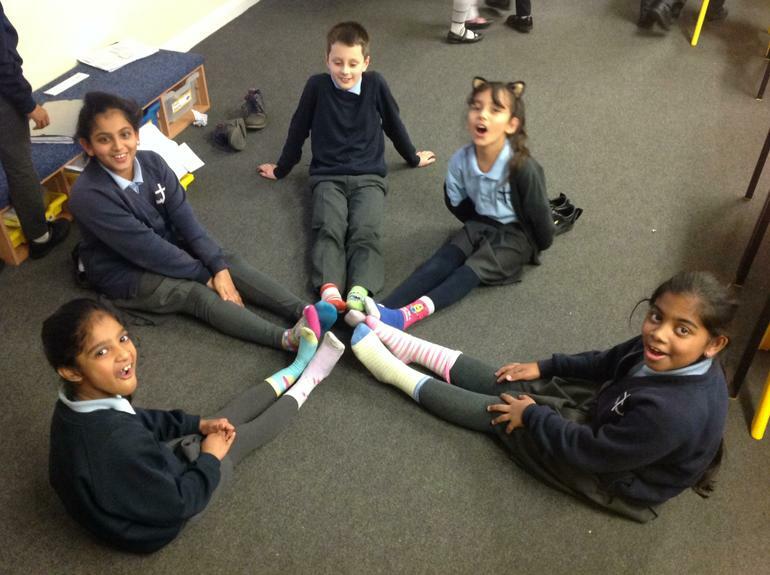 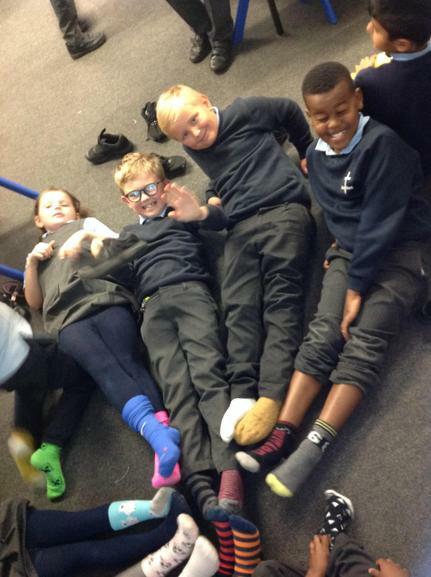 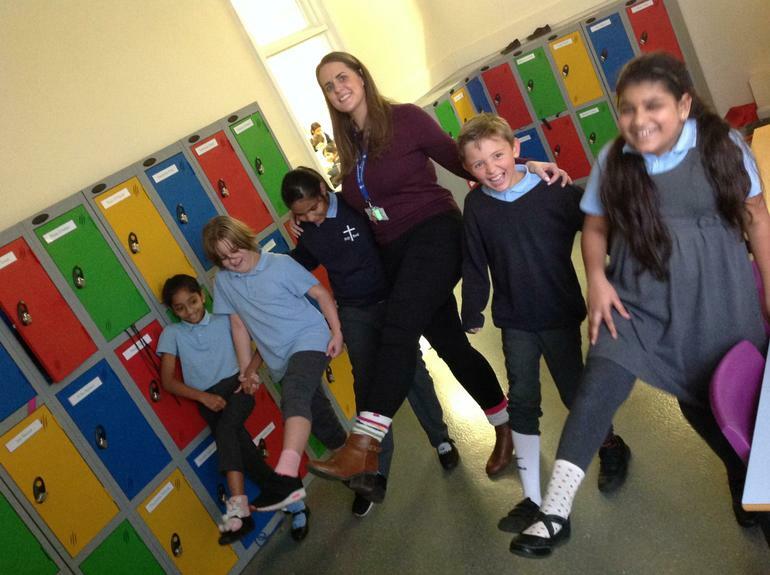 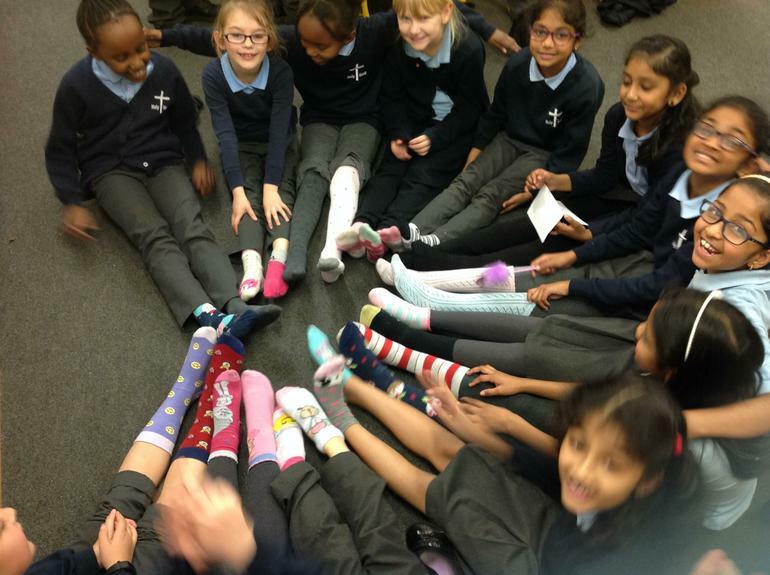 We really enjoyed wearing our odd socks on anti-bullying week to represent how we are all unique! 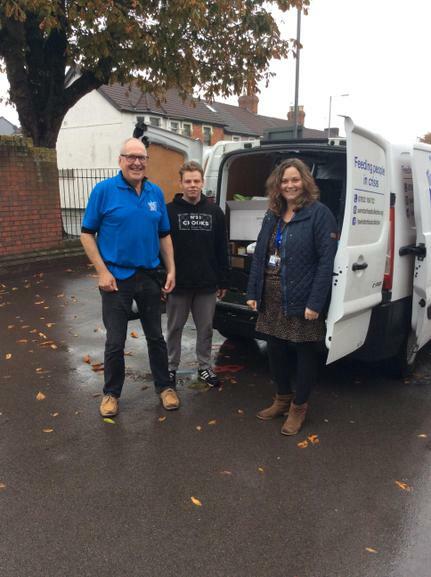 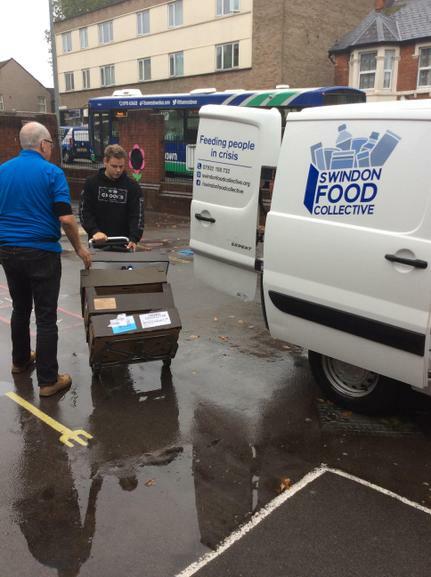 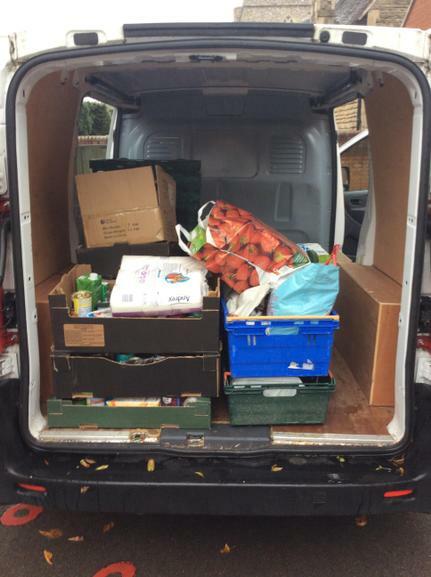 Swindon Food Bank would like to thank Holy Rood School for the generous Harvest Mass food donation.